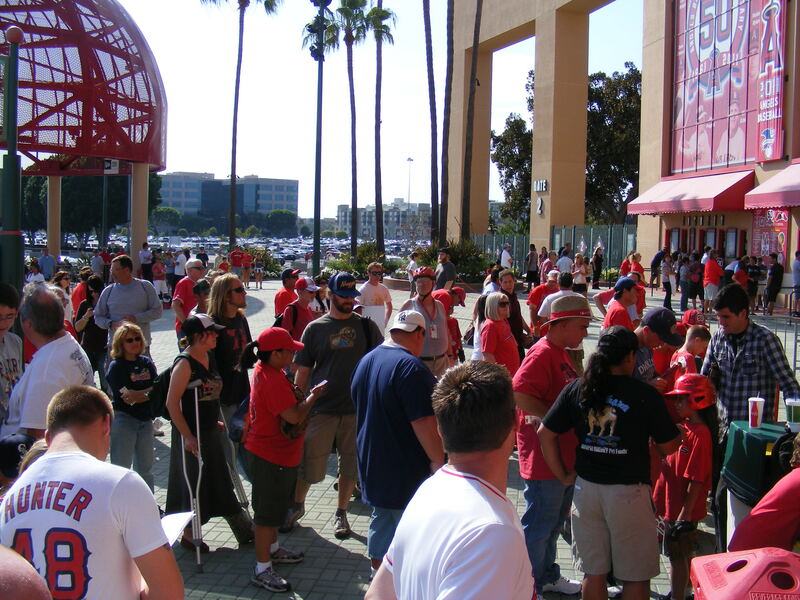 It was Dan Haren bobblehead night at the Big A and I was expecting a big crowd. I was happy to have Michelle with me at this game though–it had been over a month since the last time she’d come to a game with me. 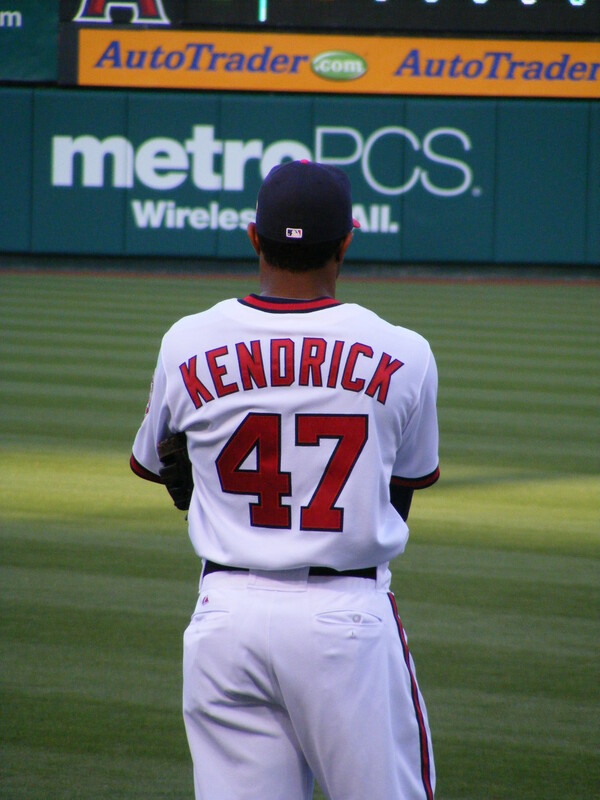 My first ball came off the bat of Howie (I’ll never call him Howard) Kendrick. He sliced a ball down the right field line. 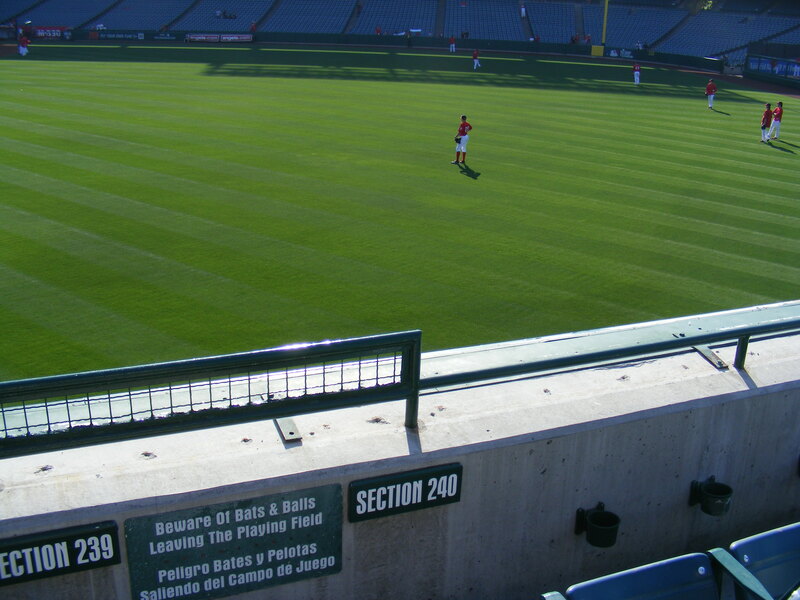 I was able to position myself perfectly along the wall and scoop it off the warning track. In my notes I wrote: #317-scoop Kendrick hit RF corner pretty colors. The “pretty colors” thing came from the variety of markings on the ball. I took the following photo when I got home that night. The photo doesn’t do it justice but it had green grass stains, reddish-brown warning track dirt, dark green markings from hitting the Anaheim seats, and a lighter brown marking (probably from pine tar/rosin), black bat marks, and blue markings from something else. 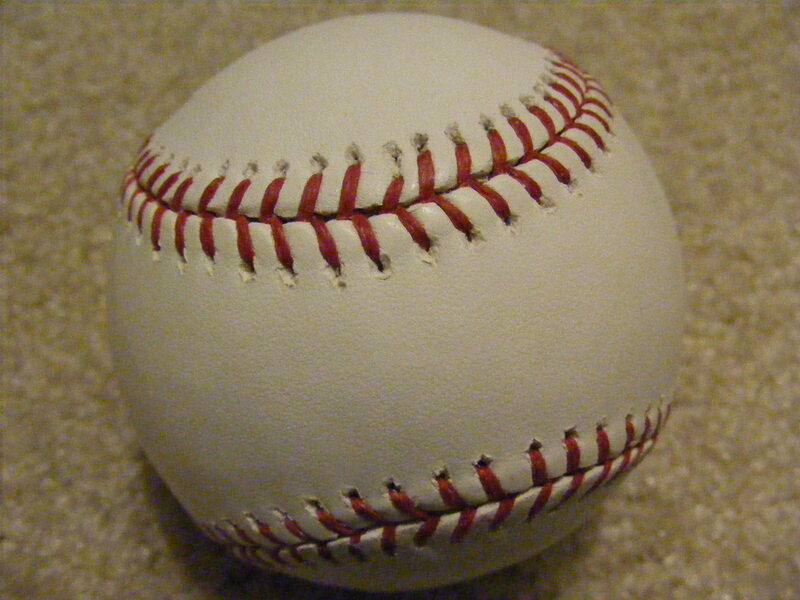 What causes blue markings on a BP baseball? Bam! 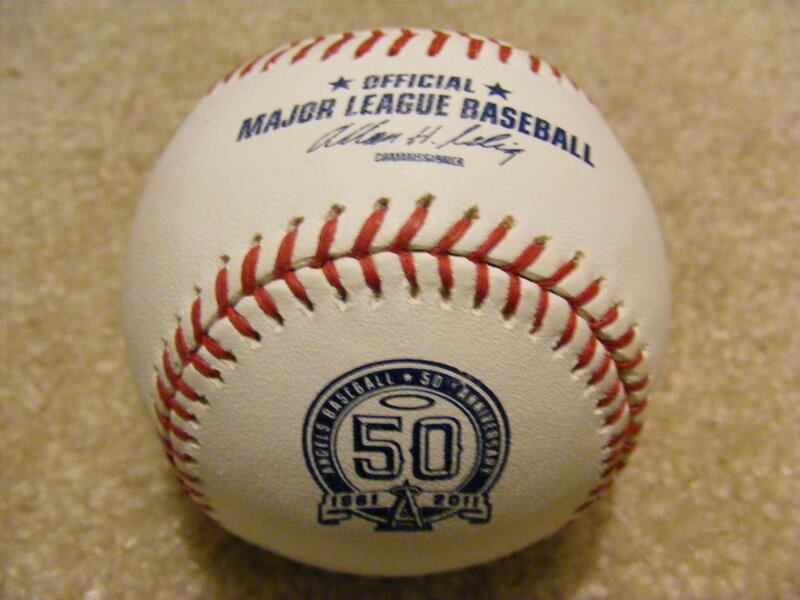 A rubbed-up commemorative baseball. All I had to do was yell out, “Sean!” and flap my glove. He fired a strike right up to me. That was Ball #3 on the day. Ball #4 on the day came off the bat of Danny Espinosa and he smashed a drive to Section 239 of the pavilion and I ran a section and a half to my right, watched the ball fly six feet over my head, and then snagged it from where it settled in a folded seat. It, too, was a commemorative ball. Score. Why were the Angels hitting/throwing me practice balls and the Nats were hitting/throwing me commemoratives? See the ball through the webbing of his glove? But he got his comeuppance. 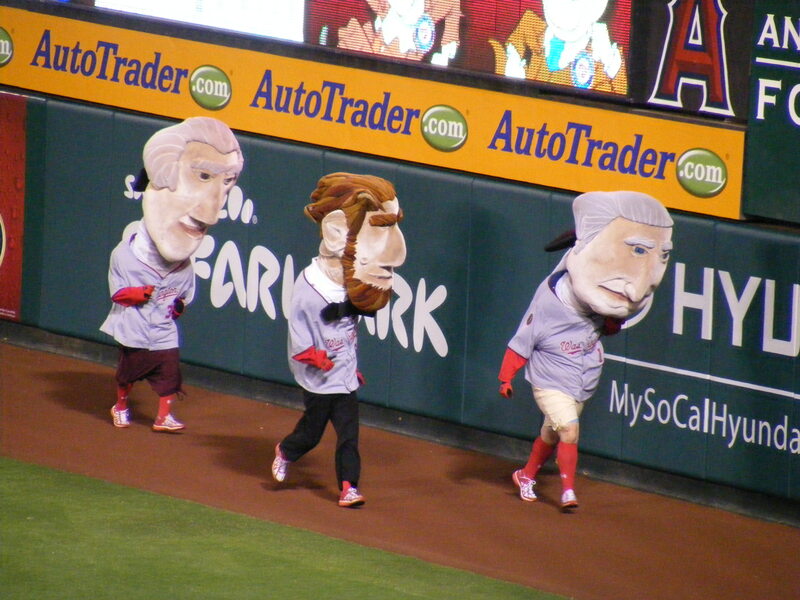 In case you weren’t sure, George, Abe, and Tom started the race. Teddy was hiding in the right field tunnel. He jumped out, threw a shoulder, knocked down the other three, then did a silly dance before taking off for the finish line. 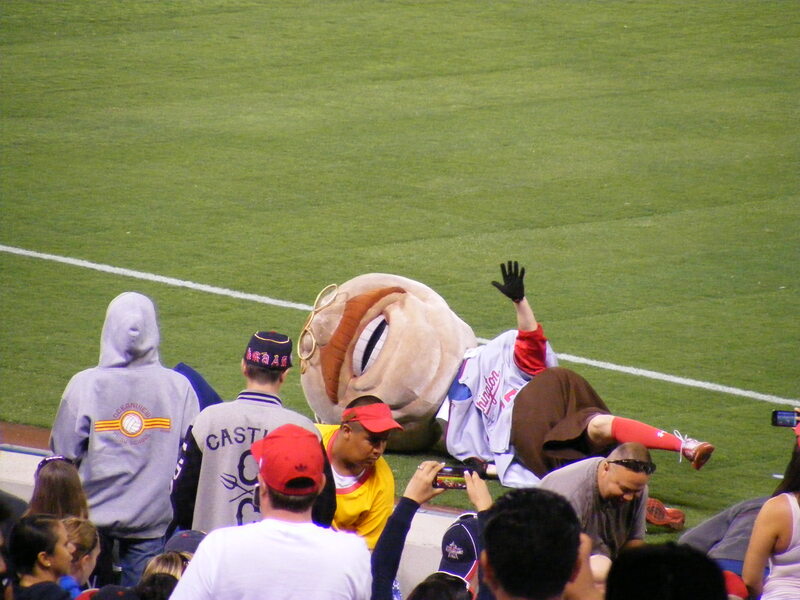 Abe was close on his heels and when Teddy got about twenty-five feet from the finish line he fell down. And Abe passed him up for the win. Teddy thrashed around on the warning track for a good thirty seconds before retreating in shame. I tried each inning to get a third out ball but Michael Morse kept bouncing the ball to someone in the dugout. He did it every time. The only chances I really had were when flyouts ended the innings and folks like Espinosa or Roger Bernardina ended up with the ball. I just wasn’t having any luck though. Michelle snapped a photo of me (left) on my return trip from one such attempt. 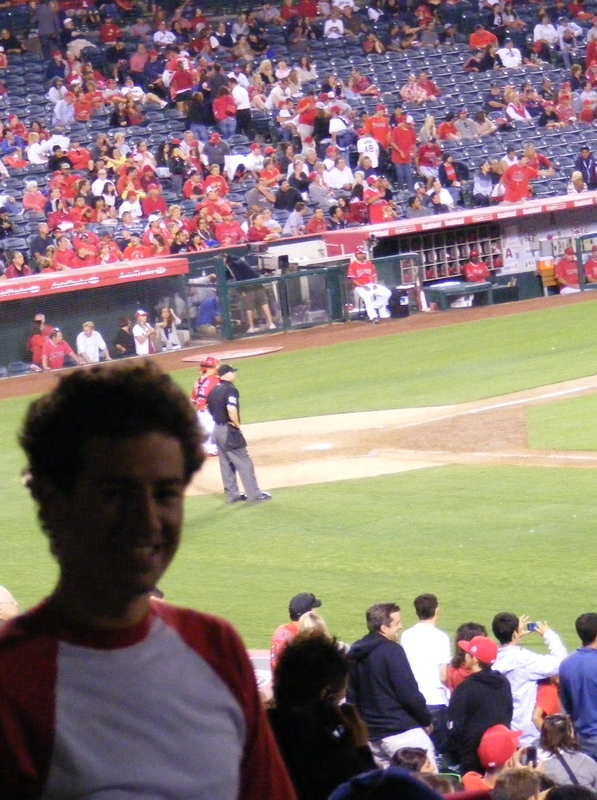 Notice that I am smiling despite being shut out since the end of batting practice on this particular night. Gotta keep a good attitude! Also… I could really use a haircut. 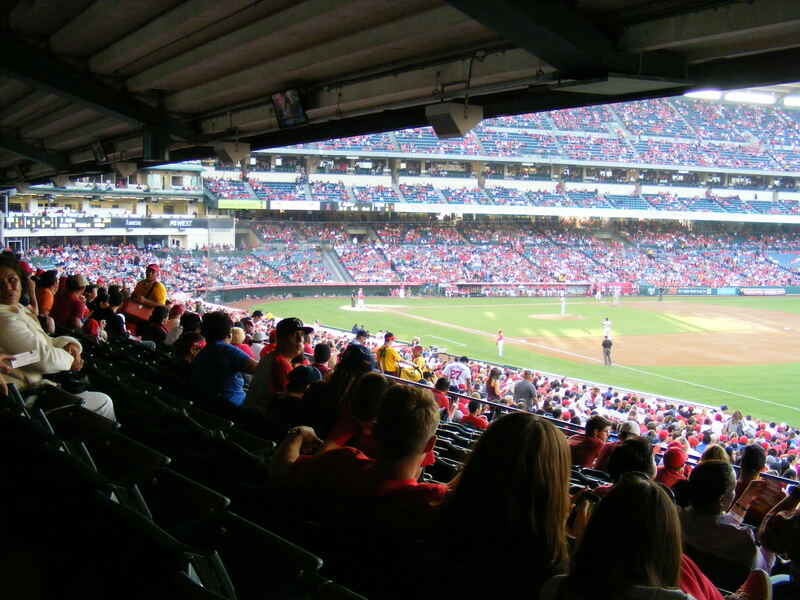 And I took a few photos in order to create a panorama of our view through the majority of the game. I would be heading back the next day! 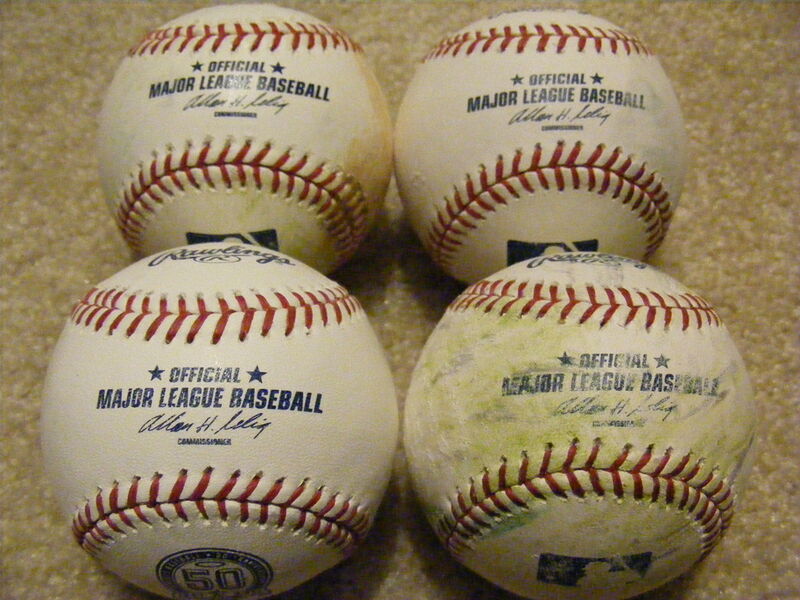 I’ll just come right out and say it: This wasn’t my most successful day of snagging baseballs. No, siree. For those of you that read my previous entry, you know that I began the day sitting on 299 baseballs snagged in my lifetime. I wanted to be sure to pay close attention to the players on the field–who was hitting–who was shagging balls in the outfield–I wanted to know who Ball #300 would come from. Michelle and I arrived at the Home Plate Gate at about 4:40pm, saw some regulars we knew, jumped in line with them… and waited. At 5:03pm the gate opened and I ran inside and headed to left field. I was hoping that Torii Hunter or Mark Trumbo would clear the bullpens and hit me my first ball of the day. As it turned out, Trumbo did hit one that cleared the home bullpen and most of the visitors’ bullpen… it hit the metal “roof” that shades the visiting players while they sit on the bullpen bench. I had the snag lined up but the ball fell just short of the front row, hit the roof, bounced awkwardly over me and to a guy right behind me. If he’d been five feet in any other direction I’d have been able to walk over and simply pick up the ball… Alas, #300 would have to wait a little longer. 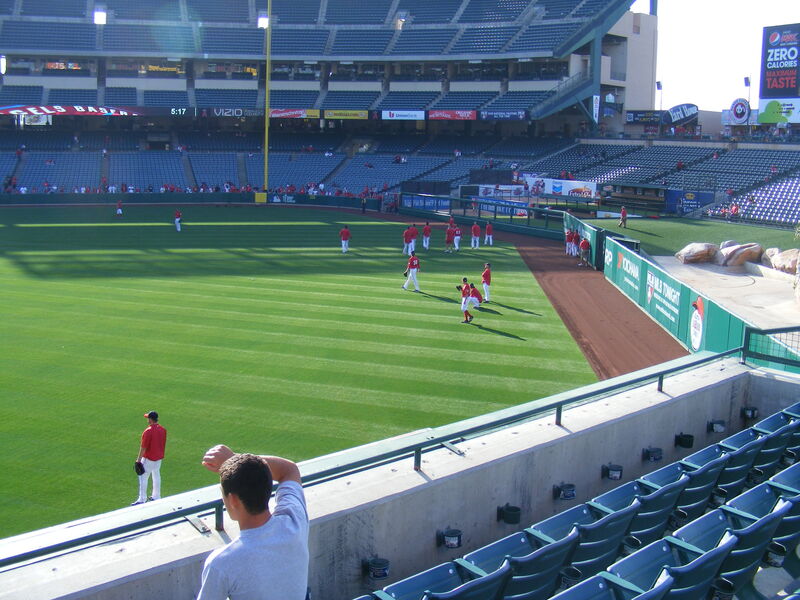 I ran over to right field shortly after the second group of Angels finished hitting, knowing that there weren’t any batters that could hit many home runs in the last group I’d get to see. I ended up down by the foul pole as Peter Bourjous took his hacks. 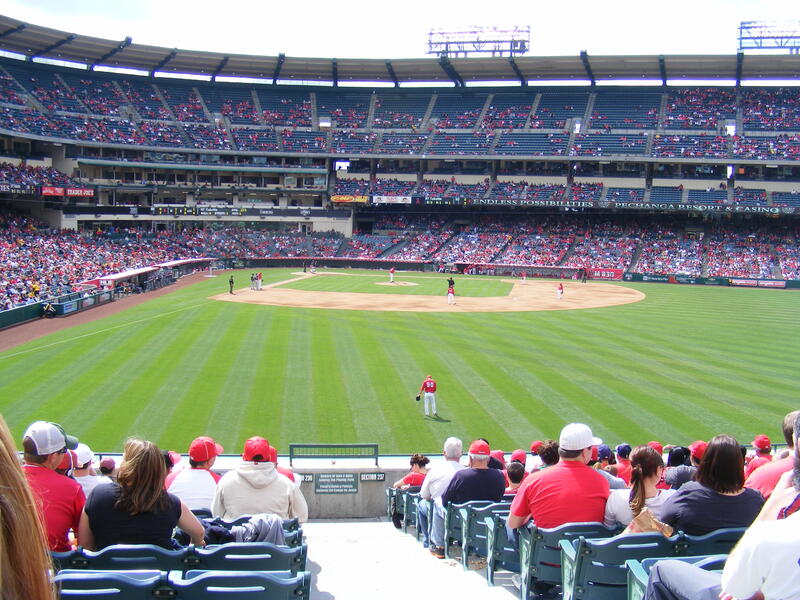 Bourjos, a righty, was going the other way and flicked a ball down the right field line that took a bounce on the grass, hit the wall in foul territory, and rolled toward the corner–where I leaned out over the wall and plucked it off the warning track in front of Section 1:34. It was 5:23pm on May 20th, 2011. 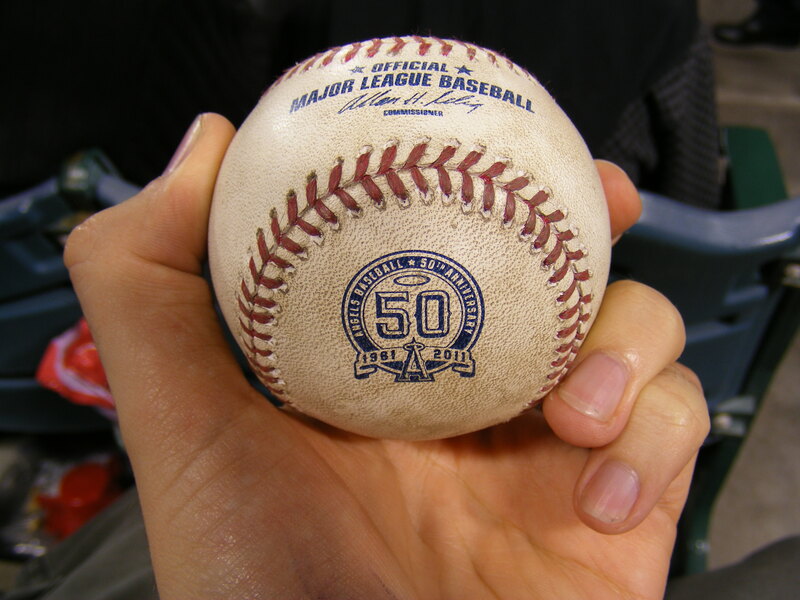 And just like that–I’d snagged my 300th baseball! I remember thinking… at least I know who it came from… and it’s a home team player (who I know signs autographs). 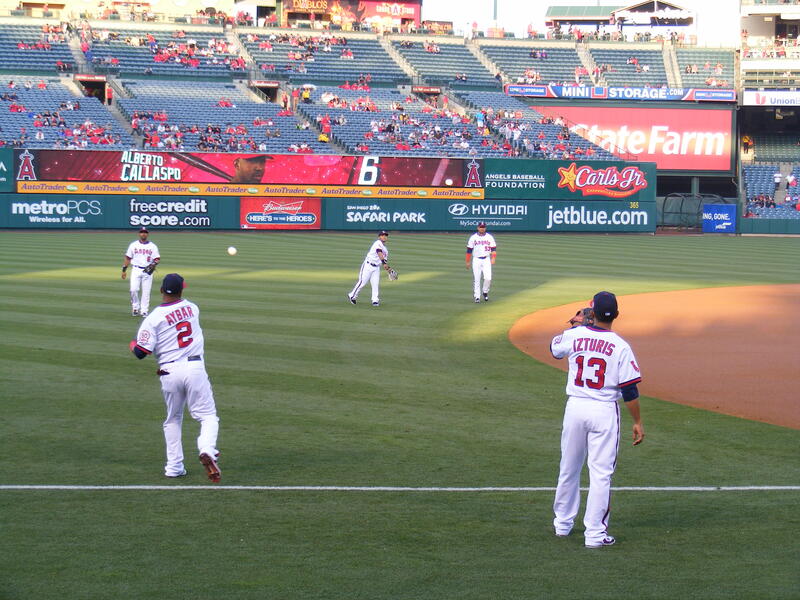 When the Braves came out to throw and hit I ran up to the pavilion since they had a few lefties with some pop. When I got out to the seats it was still fairly empty but it took about ten minutes for anything to come my way… and when Brian McCann started pulling the ball to right field I was all over a homer–until the last second when I realized it was going over my head. 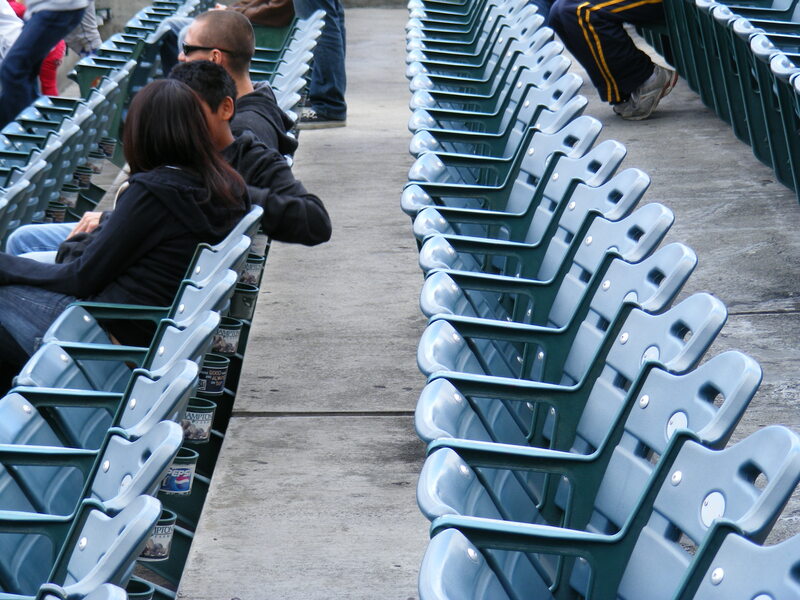 I turned my back to the field and watched the ball bounce off a seat two rows up and shoot to my left. I raced over a few seats, climbed over a row, saw Rob closing in, and reached out as the ball headed for the staircase… I missed it! But I didn’t give up and the ball bounced down a step and I grabbed it with my right hand a split second before Rob got to it. Ball #301. Here’s the view from near where I snagged the McCann ball. 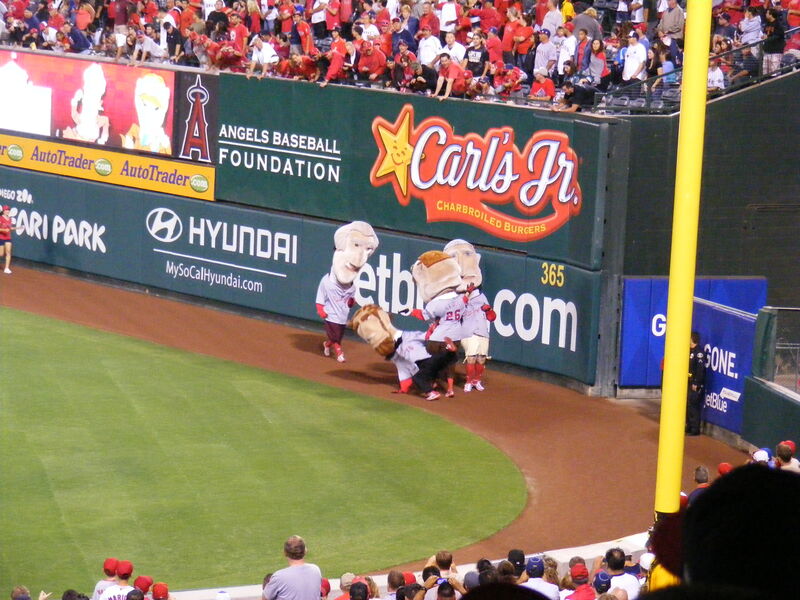 BP ended and I was ready (along with Chris) to race toward the Braves’ dugout. I blazed through two sections (and past my wife, reading a book on the Terrace Level) before my left leg caught a bit of an armrest. I was okay… until I took another step and realized I was losing my balance… I comically fell forward. The only thing hurt was my pride… and my hand–I suffered a scrape. And my watch got scratched up. Chris stopped to make sure I was okay (I was) but it meant we were a bit late getting to the dugout. I missed out on getting anything there. Scraped (and with a bruised ego–it was a silly, embarrassing fall) I sat down next to Michelle. 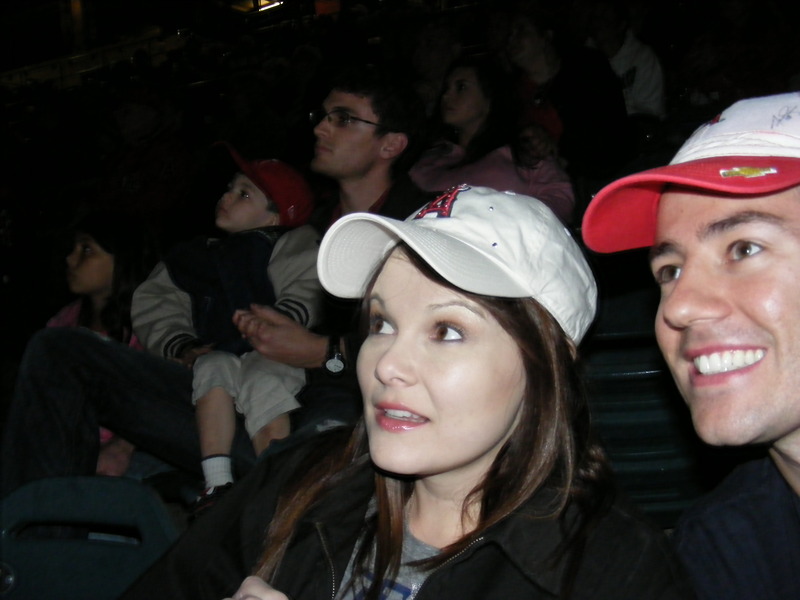 She was concerned that I was hurt–I was concerned that I’d only snagged two baseballs in an hour and a half. But at least I’d hit my milestone–the day couldn’t be considered a failure. 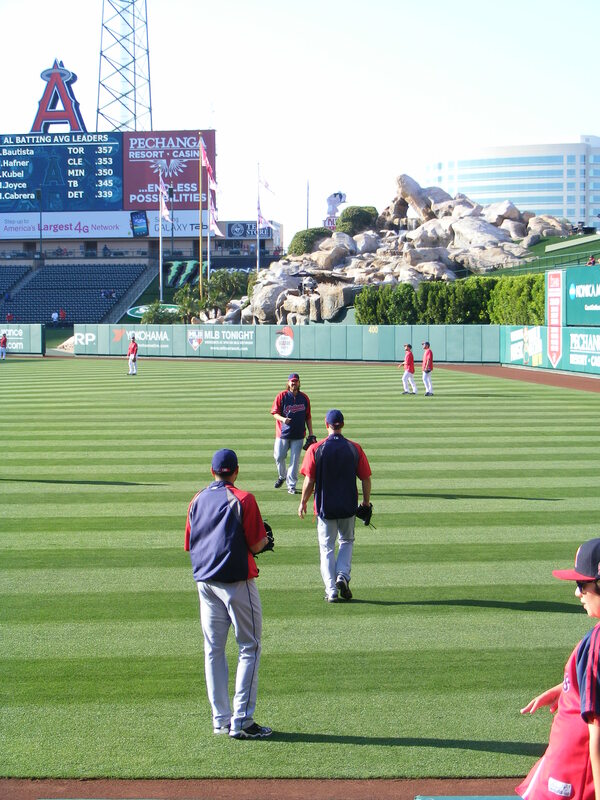 When the Angels came out to warm up I tried to get a ball from them. I was in the third row as Maicer Izturis warmed up with Alberto Callaspo and when they finished I got Izturis to toss me the ball–but at the last second a fan in the second row stuck his arm up and deflected the ball to an old lady to the left, who promptly kept the ball (it did hit her on the head–I can’t blame her). Cool uniforms, huh? Flashback Friday! Next, Alexi Amarista and Erick Aybar finished throwing and I got Aybar to toss the ball my way–but get this: a fan in the first row jumped up and made a stellar bare-handed catch in front of me. How frustrating!!! Two warmup baseballs thrown to me… and not a one of them made it to my glove. 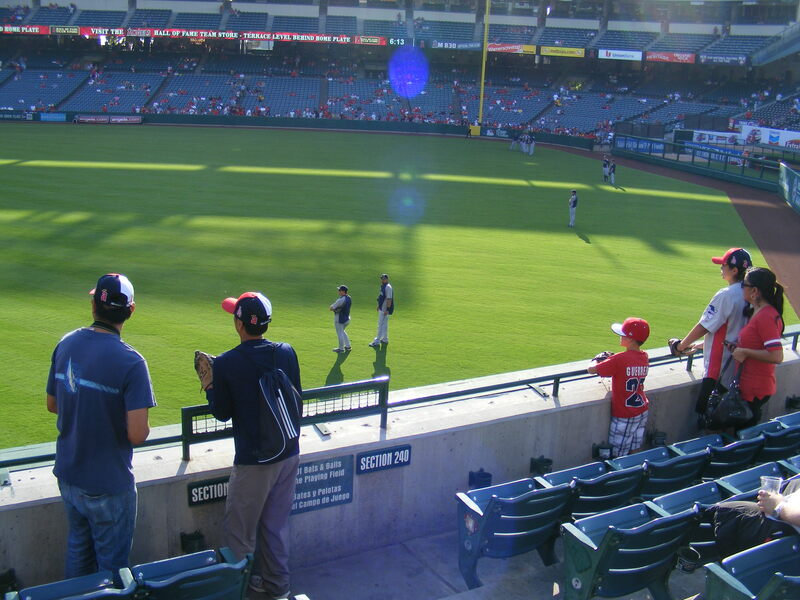 And no Braves played catch near their dugout before the first pitch–bummer. 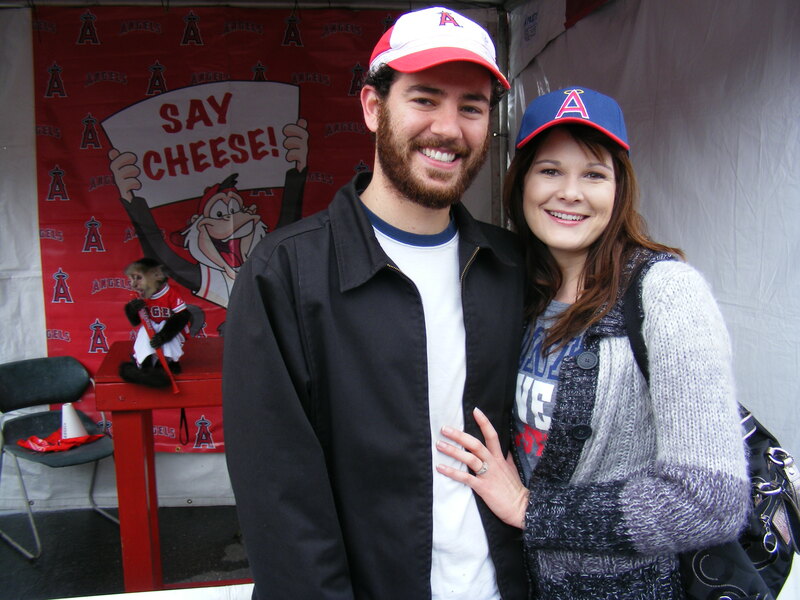 Michelle had eaten her dinner during BP and I’d scarfed mine down before pregame throwing–but we were still hungry so we vowed to try to find something healthy to eat–and we would end up succeeding AND finding a few new chow spots at the Big A. But first, I tried for a third out ball from the Braves after the first–and failed. If anyone had decided to pull a ball down the line in the middle innings I’d have been all over it! My wife and I were, like, the only people who seemed to care about the game. Everyone in the identical red hats in that photo above was there with some sort of conference/religious group/singles club. We couldn’t figure out what the organization was about–but it wasn’t a group of baseball enthusiasts, that’s for sure. We’re dancing in our seats to Lady Gaga’s “Just Dance” and Michelle is blocking her face with her arm–which is holding up her Rally Monkey… in case you were wondering. I know you were. OK… here we go… my first post now that MLBlogs has converted everything to WordPress… I apologize for all the weird formatting things throughout my older blog posts… and for not getting this one posted sooner. 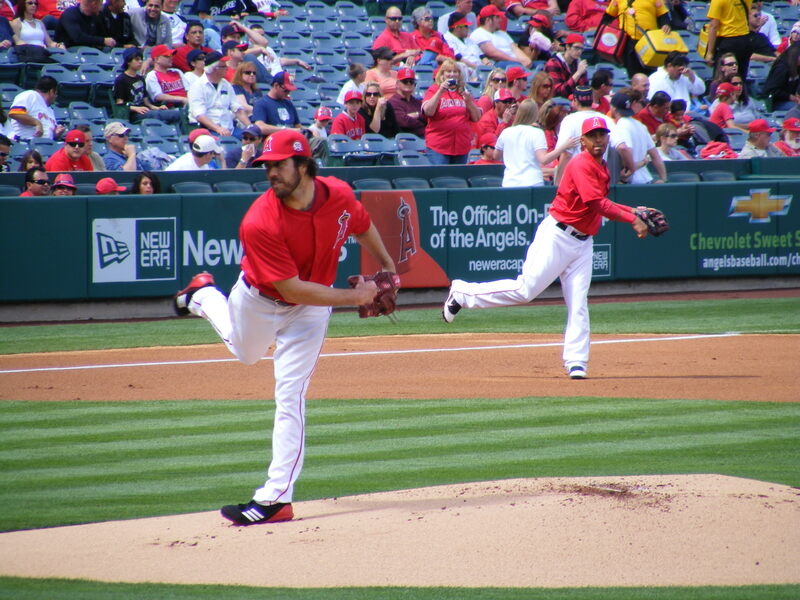 It was a great day at the Big A. Once I was inside the stadium I committed an error. 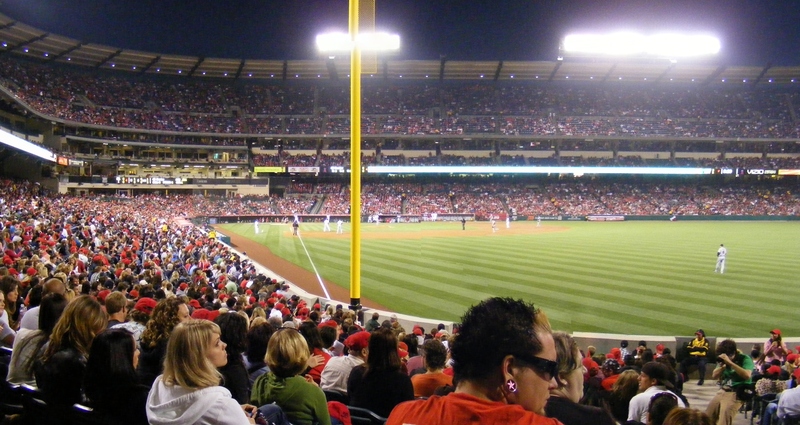 I was in the right field seats and was the first one there–I saw a ball get hit to where near an Angel was shagging balls in the outfield. 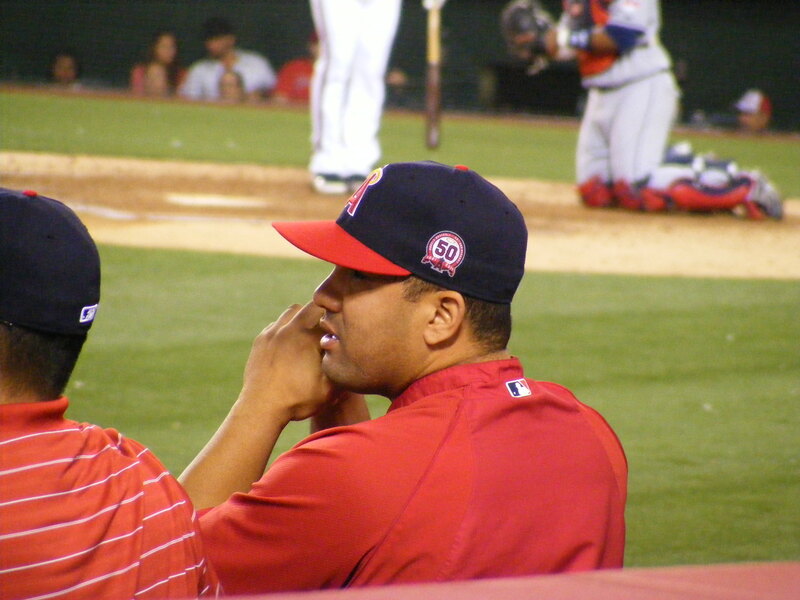 I thought it was Jordan Walden and yelled, “Hey, Jordan! Could you toss that one up, please?” The guy looked at me for a moment, then tossed the ball back toward the bucket. In that moment of brief face to face time I recognized him as backup catcher Bobby Wilson… not fireballing closer Jordan Walden. Oops… stupid coverups. The ball had a black PRACTICE stamp on the sweet spot. 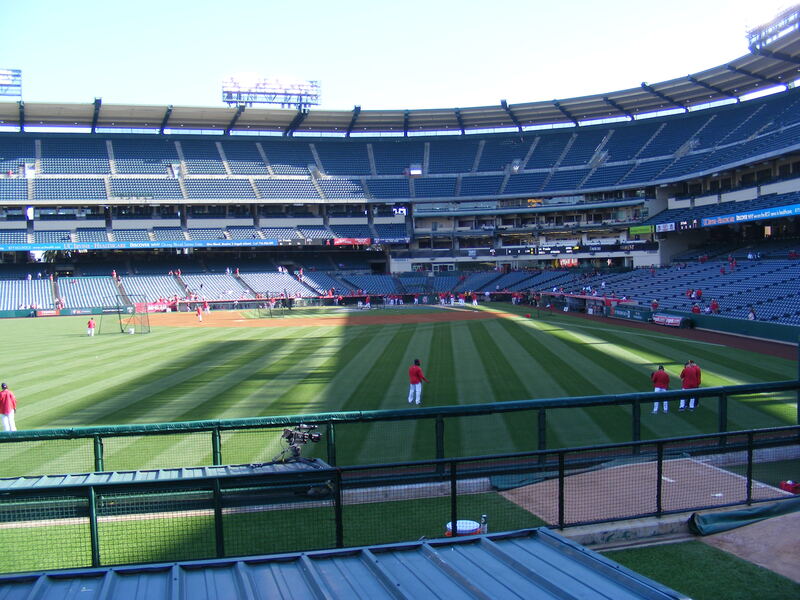 I’ve decided, after fruitless attempts to catch home runs during the home team’s BP in right field, that I’m going to start snagging in the left field seats from now on… there is just no lefty power in the Angels’ lineup. I spent most of their BP watching balls just miss being home runs. Ugh. 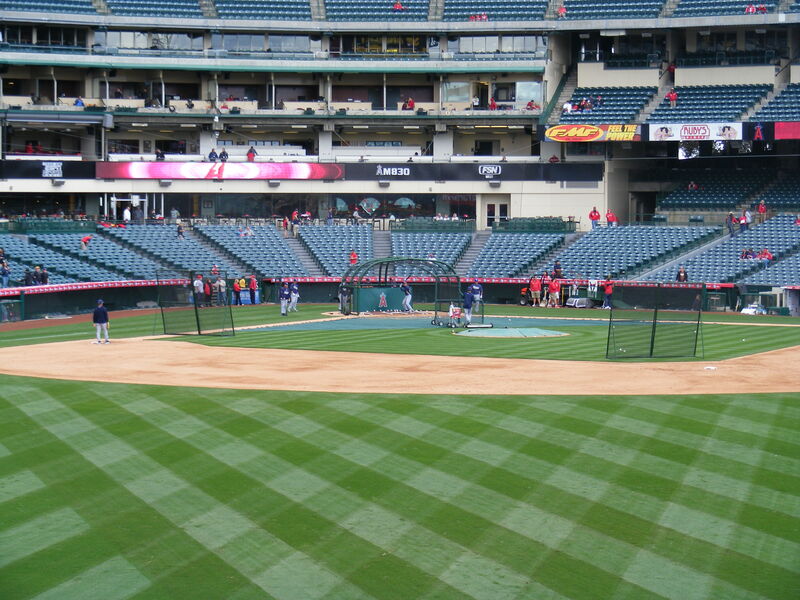 So, in the Halos’ last round of batting practice I headed down the first base line and asked a couple of pitchers for toss-ups. 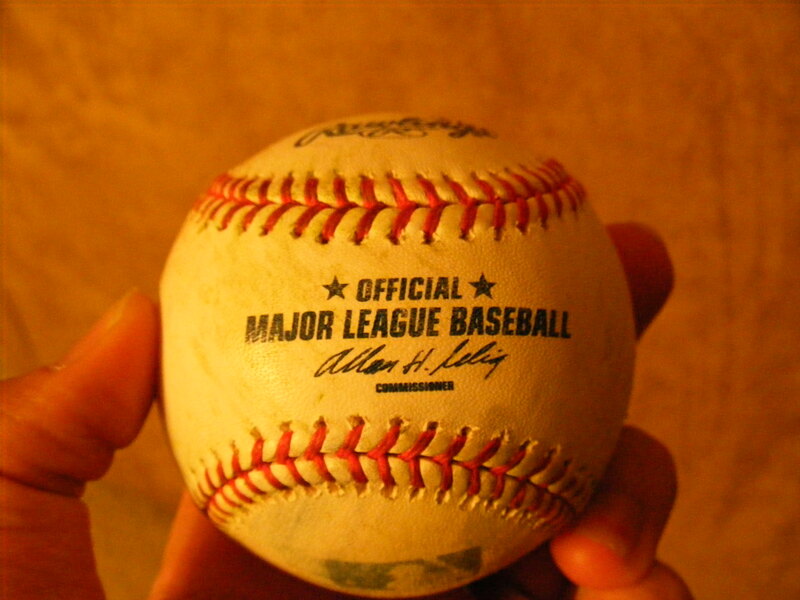 Reliever Francisco Rodriguez ended up getting a ball to me in a way I’d never gotten one before. A blooper died on the grass in front of him and he walked toward it. Rodriguez was about ten to fifteen feet from the wall and I was in the third row. As he neared the ball, he flipped it up a few inches with his foot and bounced it to his other foot, then kicked a tailing pop up to me, soccer-style. I moved to my right a little bit and snagged my second ball on the day. It was a standard Selig ball and I ended up giving it away to a kid (the kid in the below photo, actually) a little while later. 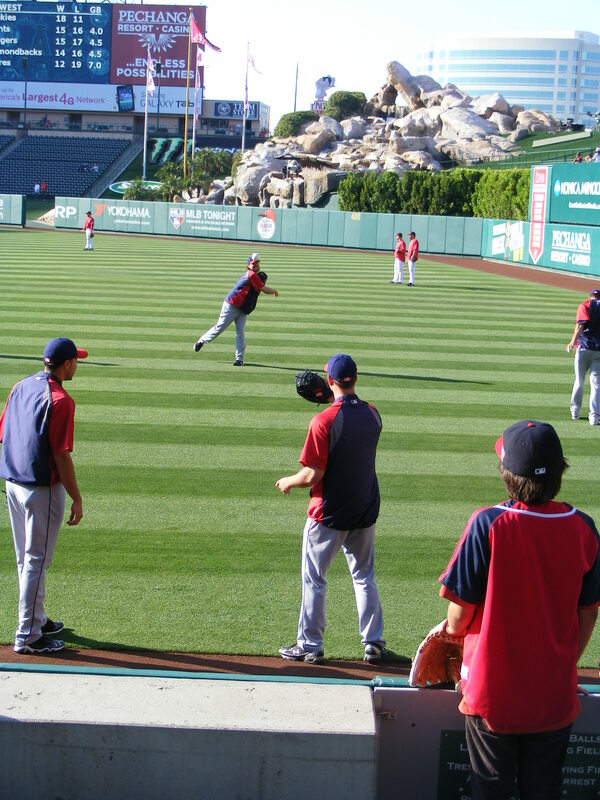 That was it for the home team’s BP session and the Indians pitchers had come out to run, stretch, and throw. When Chris Perez arrived near the foul line in front of me without a throwing partner he looked back toward the dugout in a way that I would call ‘longingly.’ I took the opportunity to ask him, “Hey, Chris! You need someone to play catch with?” Then I held up my glove. I’d never actually played catch with a Major League Baseball player before but I’d asked a few–usually they chuckled or just ignored me but Perez responded, “Yeah.” I gestured to my awaiting glove and flapped it open then closed. He asked me, “You’ll throw it back?” I told him I would. Then they finished their throws, chatted for a moment… and wouldn’t you know it? Perez threw me the ball. I thanked him and then I labeled it with a ‘294’ (as it was the two hundred ninety-fourth ball I’d ever snagged) and tucked it into my backpack. My first baseball that I’d actually thrown back and forth with a Major Leaguer! Sweet! I’d missed out on a few chances up in the pavilion while I was waiting for Perez to finish throwing so I bolted up the stairs and through the concourse to the right field seats again to catch the last half of a group of lefties. Shin-Soo Choo drilled a ball high into the air and pretty deep. I moved down a few steps to the fourth row and ranged to my left. 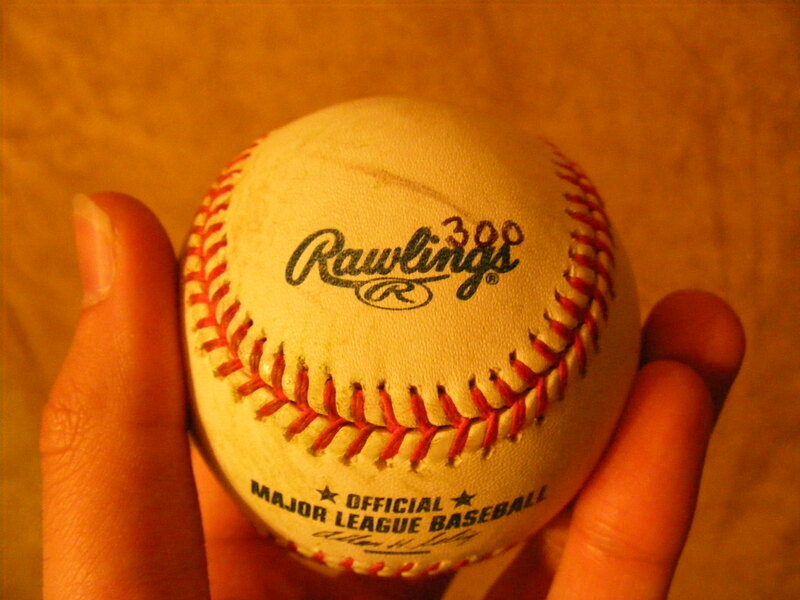 I was in Section 237 and got to a spot where I anticipated the ball would land, drifted a bit further to my left while tracking the ball, saw the gloves of other fans come darting in from all sides, reached high up and ::SMACK::–I felt the ball hit the pocket of my glove. 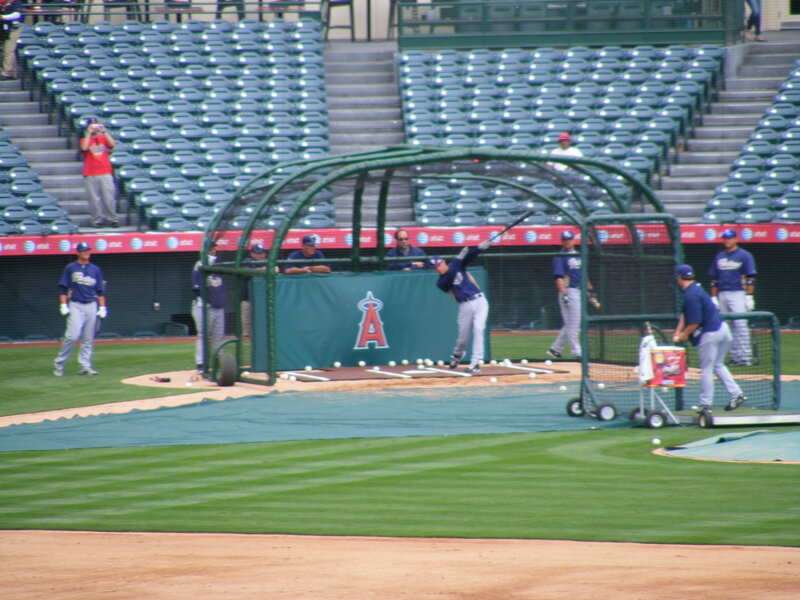 Whew… it’s always a great feeling to catch a ball on the fly during BP–it’s something I don’t get a lot of chances to do in Anaheim. That would be the last ball I managed to snag during BP and the Indians jogged off the field unexpectedly at about 6:20pm. Usually the visitors are out there until at least 6:25… so I was a bit late getting to their dugout and didn’t get a toss-up there. I did, however, get Vinnie Pestano’s autograph on my ticket stub. 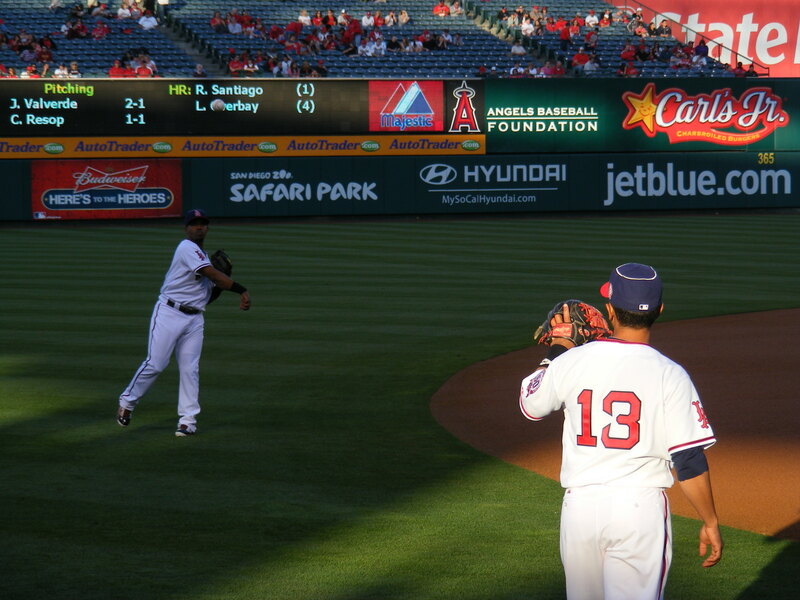 And then I watched as two sets of Angels played catch before the game. 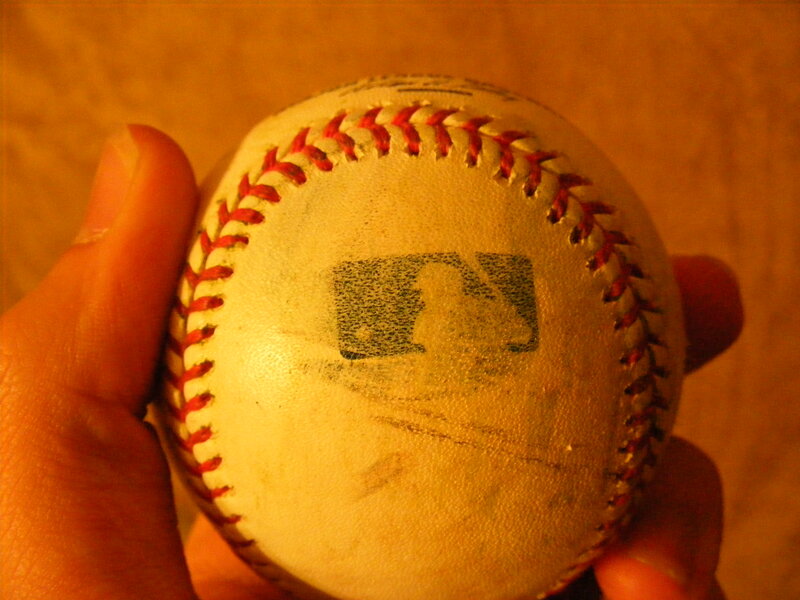 Maicer Izturis ended up with the ball after he and Alexi Amarista finished throwing and he tossed it right to me–almost a brand new ball–just two grey smudges on one side. And a moment later I got my second autograph of the day: Rich Thompson (over at the dugout). 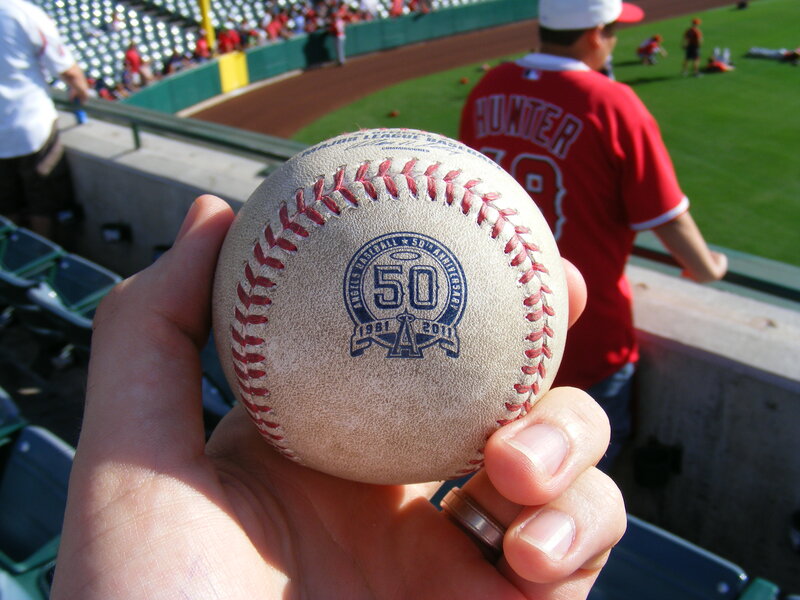 I should take time now to mention that all of my five baseballs snagged at this game so far were standard baseballs–none of them had the Angels 50th Anniversary commemorative logo. I knew I had a good shot of snagging a ball during the game though–so I was counting on getting at least one commemorative before the night was over. And when Torii Hunter stepped up to bat with two outs I was ready. Torii grounded out to the pitcher, Justin Masterson, who threw to first for the third out of the inning. Matt LaPorta was playing first base and I got his attention as he entered the dugout and he tossed me my sixth ball of the night. 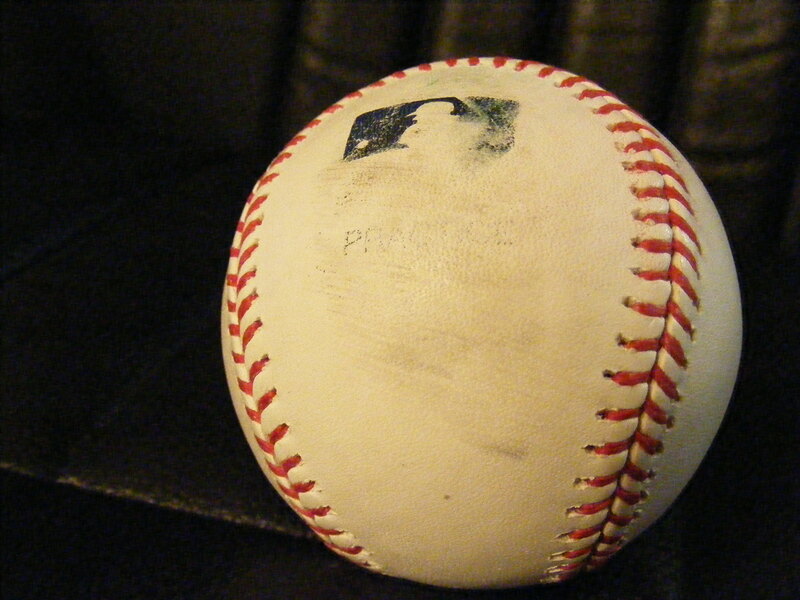 I couldn’t help but notice that it was a standard ball with dirt and grass stains all over it–the switch! 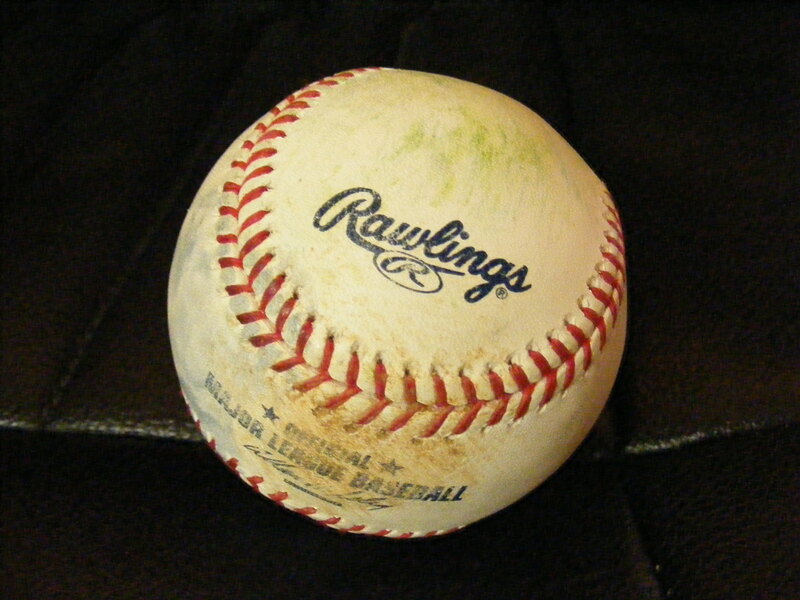 Some first basemen switch the infield warmup ball with the one that’s game used when they come in from the field. 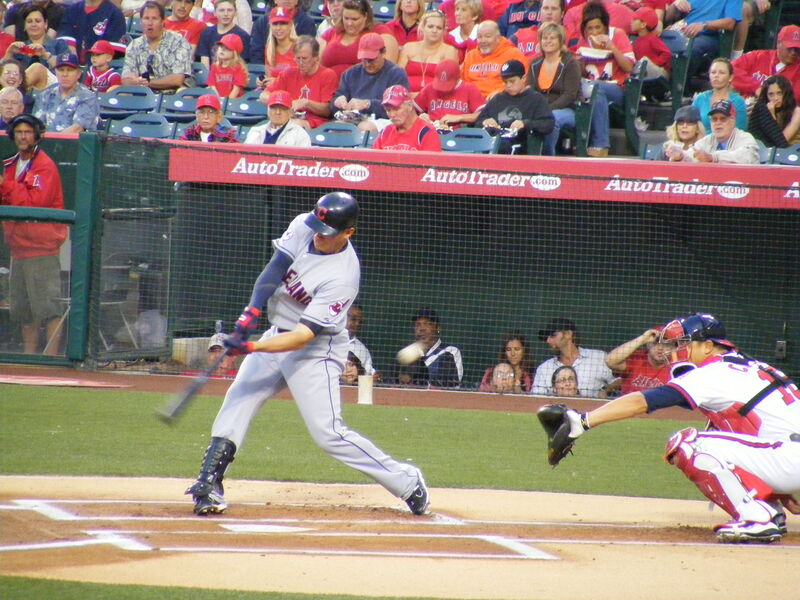 LaPorta did this the last time I saw the Angels play the Indians and he was still doing it. I described the situation to a nearby Indians fan and jotted down the following note about ball #298: Hunter grnd out to pitcher Masterson to end 1st – toss – stns grn and brwn – switch game ball – not comm – LaPorta. And I found out about a week later that he’d decided to have a second surgery on his ankle–so he’s out for the season–again. Bummer. Anyway, I took a ton of photos and had a great vantage point for the game but I was striking out when it came to third out tosses. More and more kids caught on to the game within a game and they’d crouch by the dugout every time there were two outs. I had to simply try to get myself noticed… something much easier to do if you’re little or a girl. 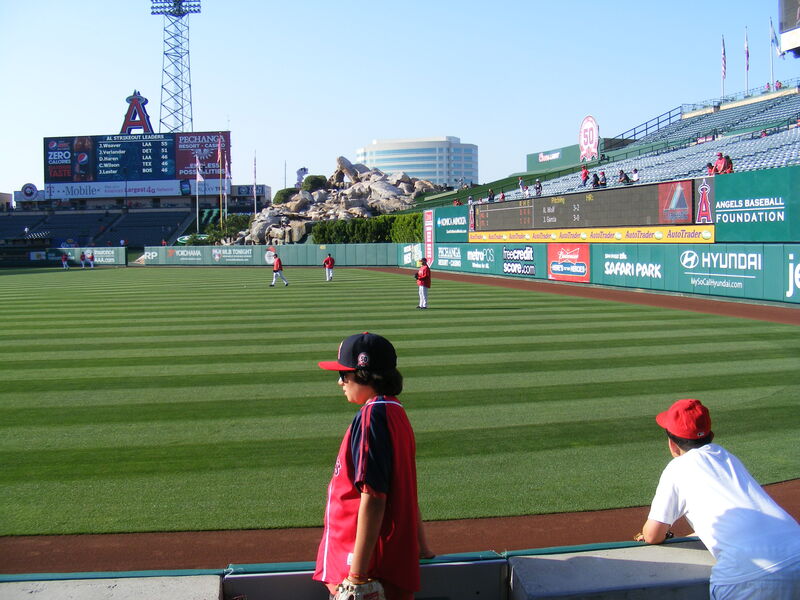 Kids and girls kept getting the toss-ups as the Angels would leave the field. Beautiful. It was at that moment–my goal for the night accomplished–that I realized I had a shot to break my single game record. 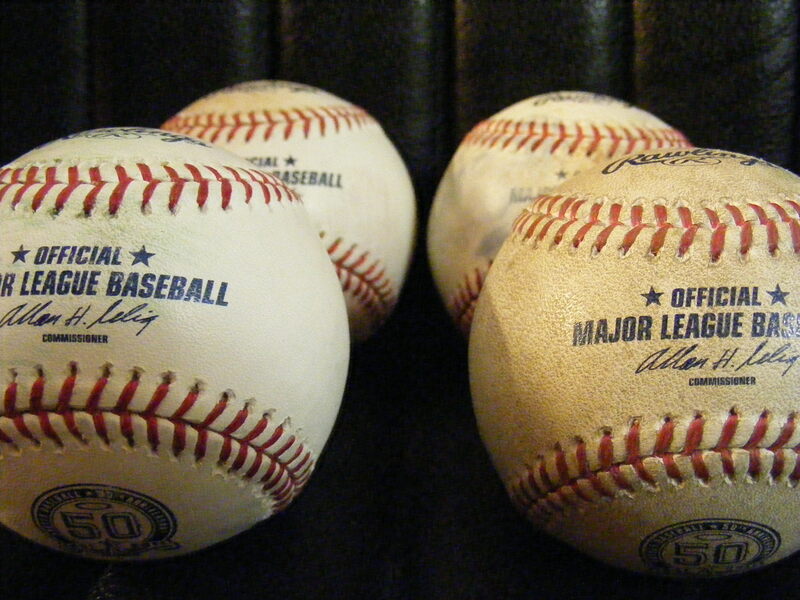 I had snagged eight baseballs–something I’d only done once before. And with the game still tied I had a shot for another ball. 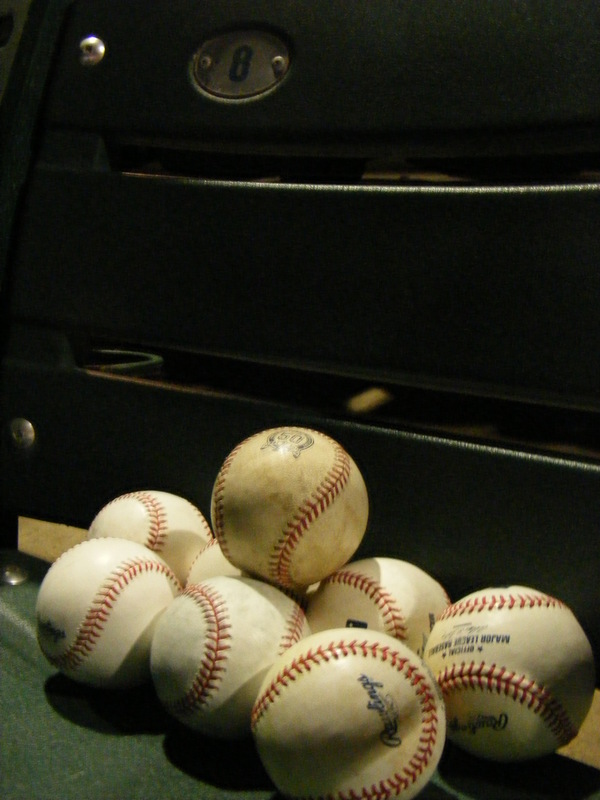 Also… I was now sitting on 299 baseballs snagged in my lifetime. I could accomplish 300 and set a new personal best for one game. I figured my best shot would be at the Indians’ dugout… less competition. 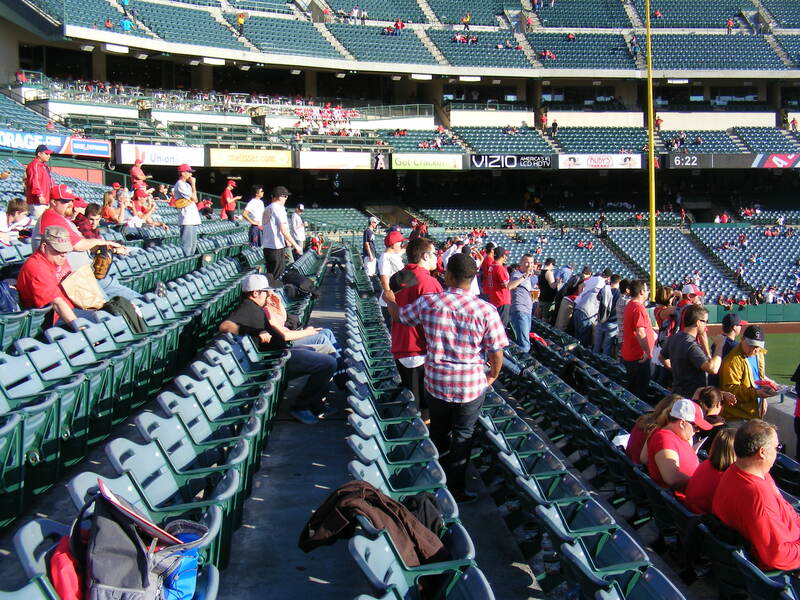 I went over there for the bottom of the ninth–the Angels didn’t score. No one scored in the tenth… I couldn’t snag the third out ball nor did any fouls come my way. I was hoping that, win or lose, the Indians would toss a ball or two up. Note the security guard and usher at the bottom of the staircase. They were there to keep people from rushing the dugout and not allowing those in the front rows to be able to leave. Also note that the Angels have two men on… yep… Aybar singled leading off the inning, then Bobby Abreu singled, and Izturis would single to load the bases for Torii with no outs. 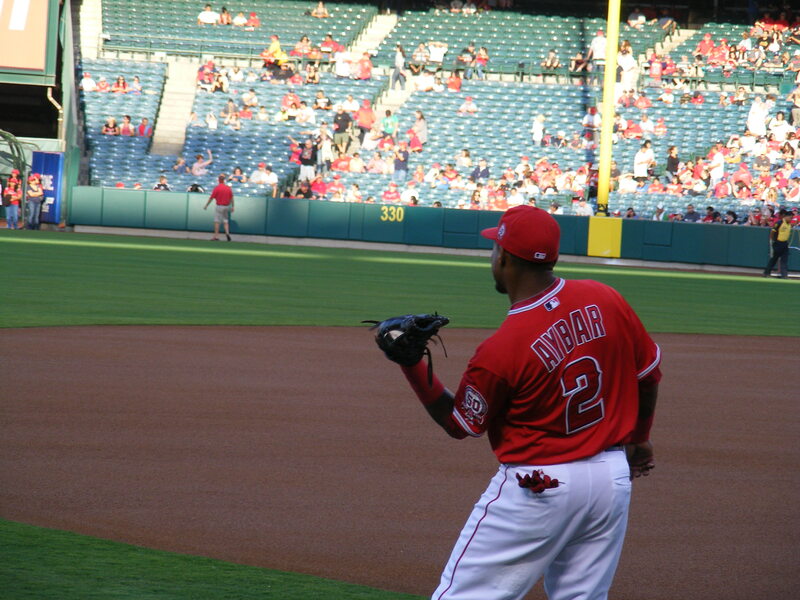 Well… Torii smashed a pitch into the left field corner to bring home Aybar and the Angels won it! Great for them… but would the Indians feel generous after the loss? One ball was tossed up from the dugout. And it wasn’t to me. 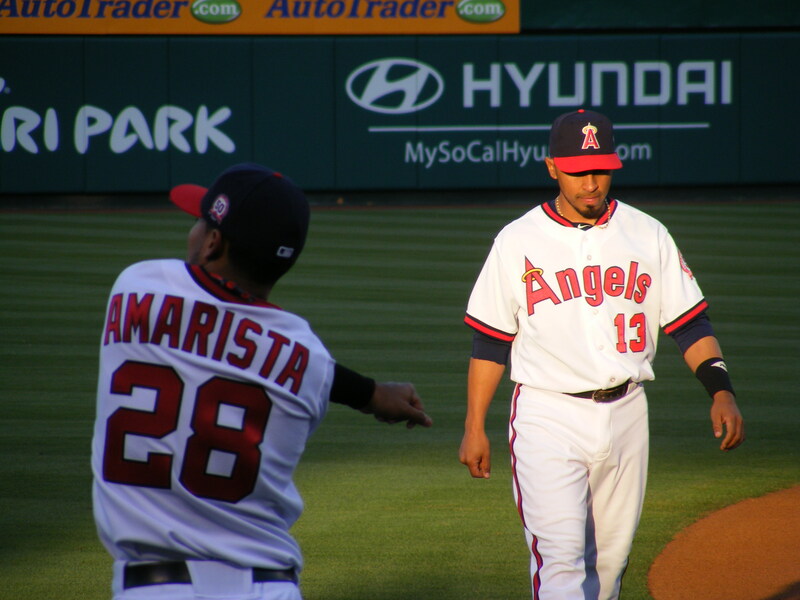 And one reliever had a ball in his jacket pocket–but it didn’t go to me. So, milestones would have to wait for another day–maybe if so many fans hadn’t decided to stick around for the fireworks it would have been a different story. 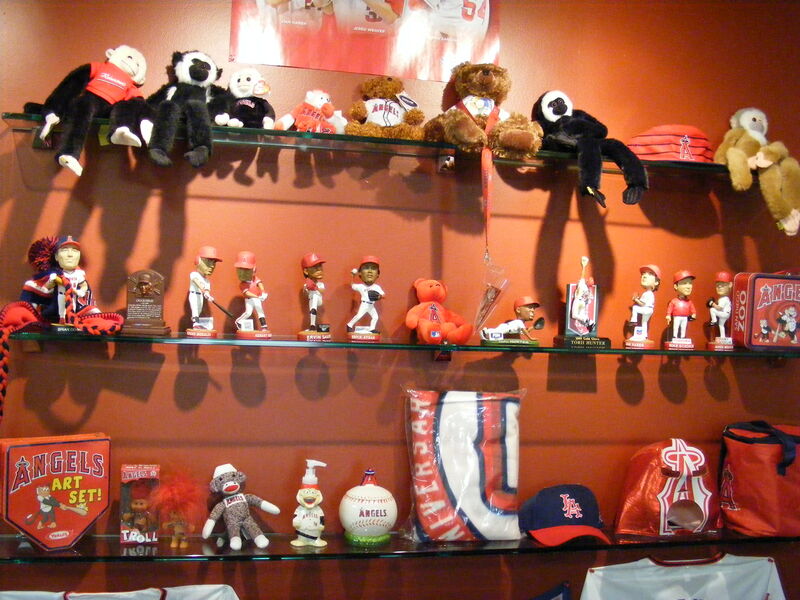 While most of the remaining fans watched the fireworks show I took a photo of my prizes from the night. A great game, a great haul, a great time at the ballpark yet again. Thanks for reading. 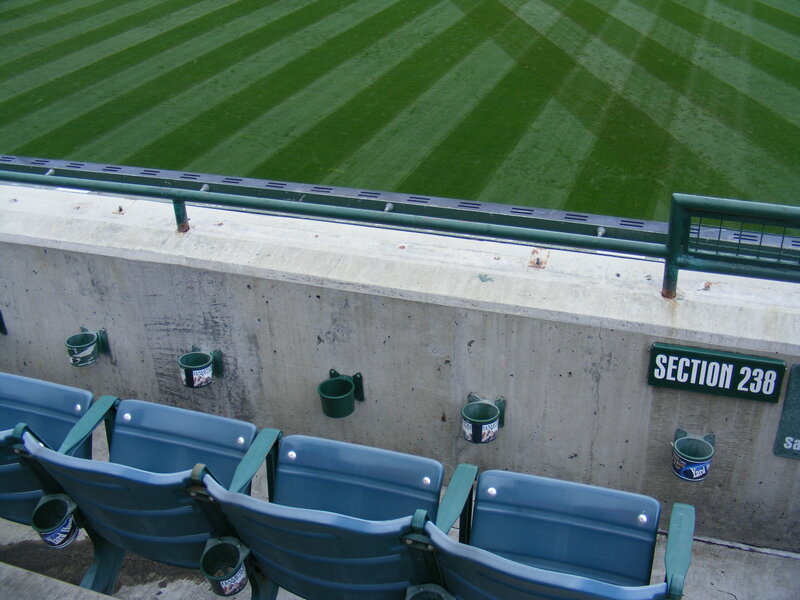 I was the second one to the right field seats so I didn’t bother looking for Easter eggs very thoroughly and instead went up to the wall overlooking the players shagging baseballs in the outfield. He did–a nice, easy toss to me in the front row–and just like that I was on the board for the day. 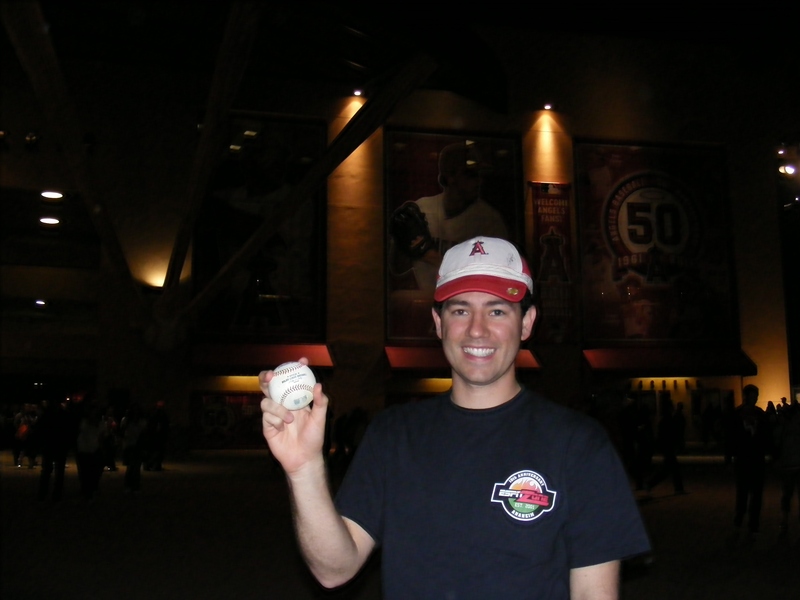 The ball was a standard baseball and I decided I’d make sure to find a young fan to give it away to before I left that night. About five minutes later I had a home run lined up and it ended up falling just a few feet short and bouncing toward a player in center field. As it turns out, that player was Francisco Rodriguez and when he retrieved it I asked him in Spanish if he could throw it back up. He looked up, gestured, and I took a couple steps back just in case his throw was short… it wasn’t… and I had baseball number two on the day. I moved a few sections to my left, closer to straight away right field, and ended up getting Ball #3 from rookie pitcher Tyler Chatwood. 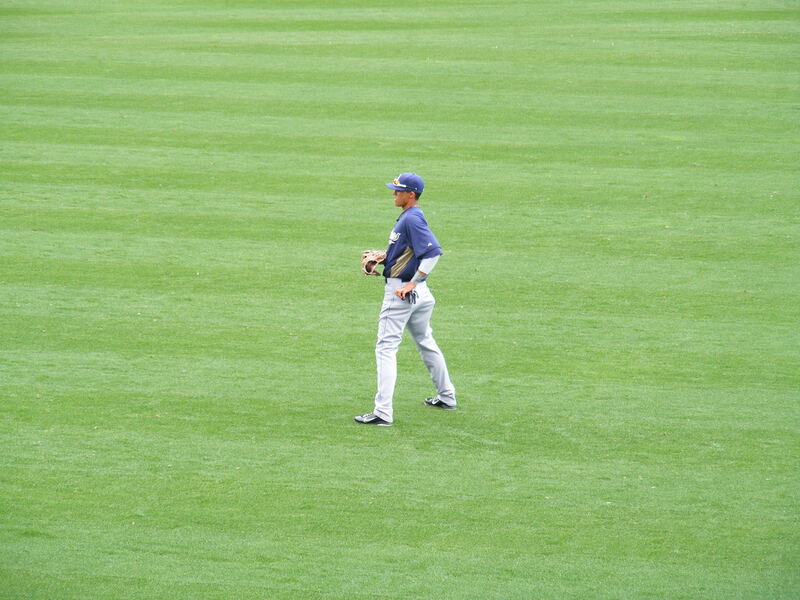 He tossed it up to me in Section 238 after he fielded a ball and turned around and saw me waving. I yelled out, “Right here, Tyler!” and that was all it took. And wouldn’t you know it? I didn’t snag another ball for the rest of BP. 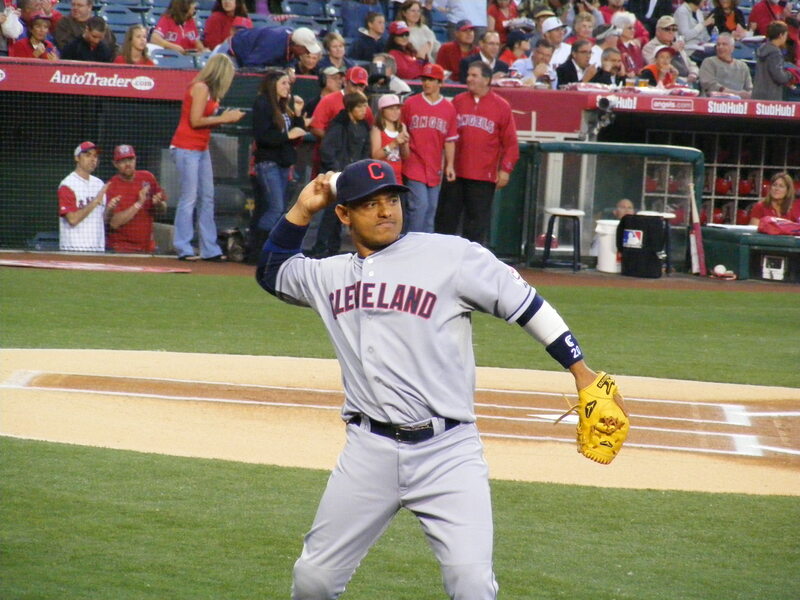 No toss ups from Indians pitchers, no mores caught in the seats from the many, many Indians lefties, no toss up at the end of BP at the dugout… and even though I was near Orlando Cabrera as he finished up his pregame throwing I didn’t get that ball, either. I sat back down with Michelle as the game started up thinking of what could have been… but I looked at the commemorative ball I’d snagged from Chatwood and decided to change my mind. 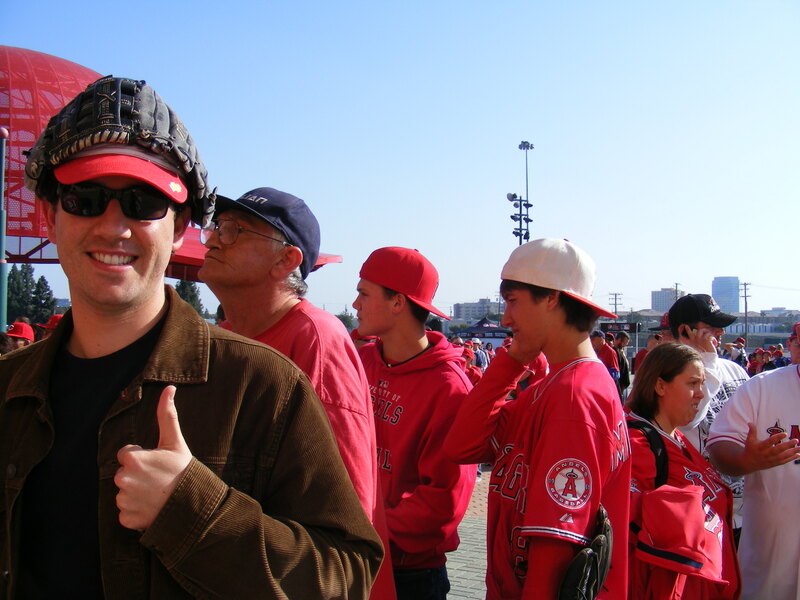 I had some excellent souvenirs and I was at a ball game with my wife–no need for frustration, right? I gave the Conger ball to a kid before the game started and the Rodriguez ball to a little guy on our way out of the stadium. That made me feel even better… but on to the game! 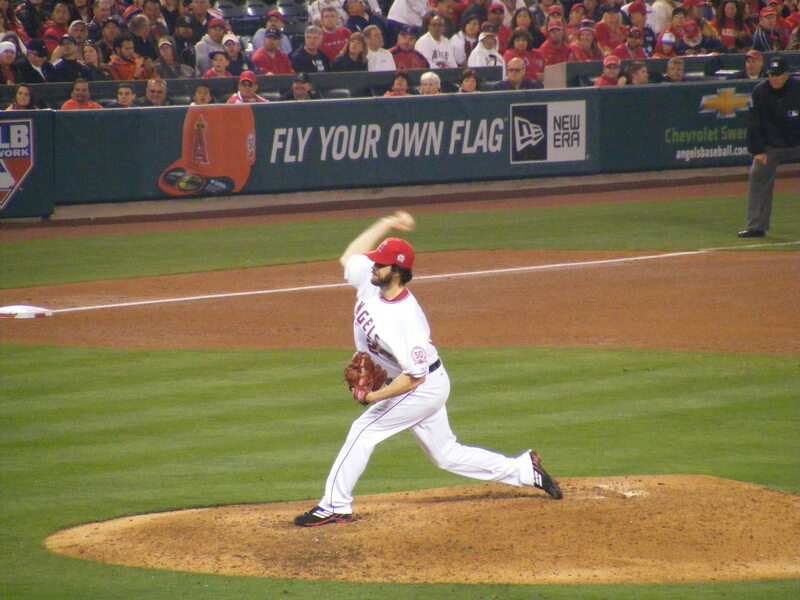 And did I mention that Dan Haren was throwing a shutout? And it would end up being a one-hit shutout! And the game was over in two hours and fifteen minutes. 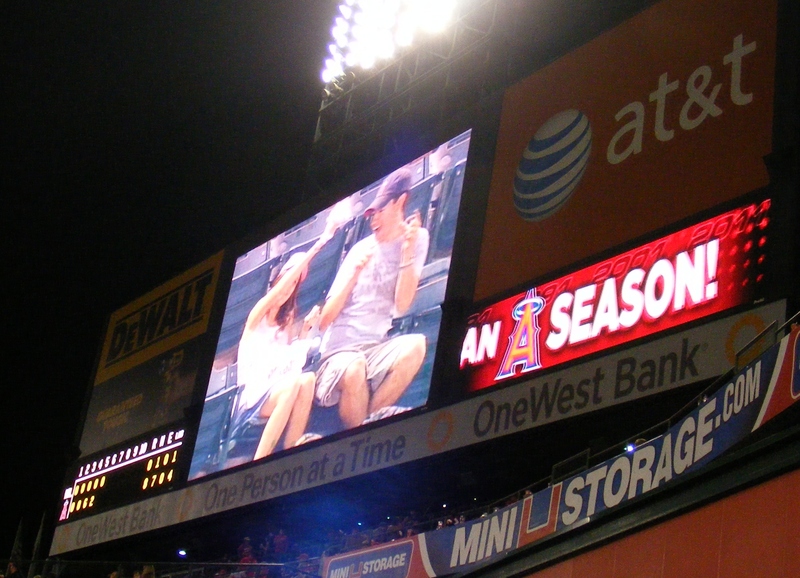 The Angels won it, 2-0. We met up with Randy and Beth after the game to chat for a bit and then headed out to the car–it turned out to be a great night. 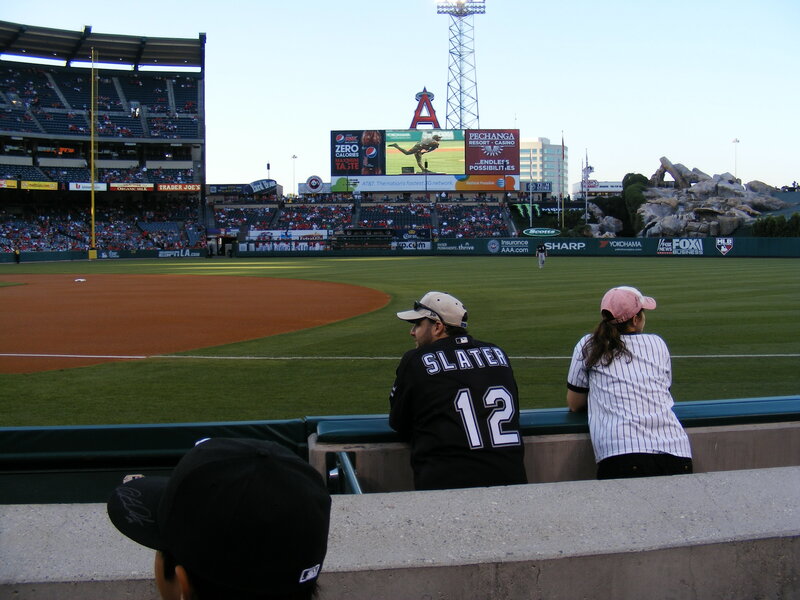 And… I had tickets to the next day’s game! This would be quite the full day. It started with me (and Michelle) waking up at the crack of dawn and heading up to the stadium. 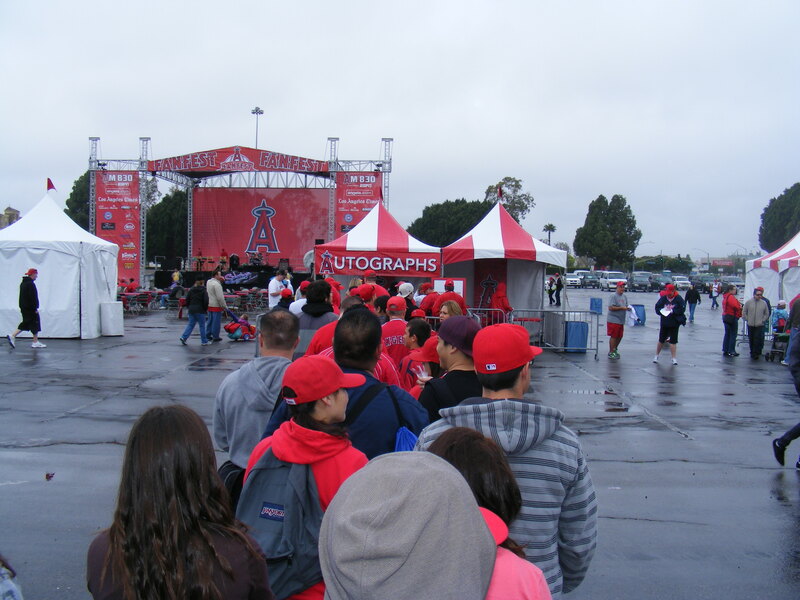 March 27th was the day of the Angels 5k and Fun Run at the stadium. I’s signed up at the beginning of the month for the 5k and I’d been training for it for a couple of weeks. 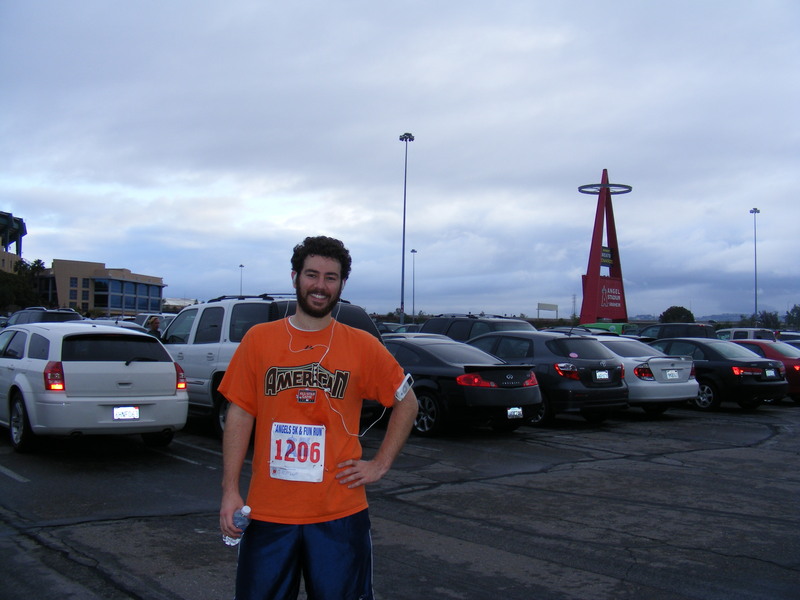 I’ve always enjoyed running and wanted to make sure I didn’t embarrass myself. We arrived at ten minutes to seven and Michelle decided she would stay in the car while I ran. I couldn’t blame her–it was early and the weather was less than ideal. There was rain in the forecast and I was just hoping to get through the run before it got too wet. I started about 500 people back and, though I can’t show you through pictures (because I was running), there were easily four times that many people there. I had a clip-on transmitter on my shoe that would track my time–as I crossed the starting line the clock already had counted up to about a minute… and when I crossed the second checkpoint (at the halfway mark) the clock was around 16 minutes… and when I approached the finish line the clock was ticking up toward 30 minutes. I crossed the line at 30:03… my goal had been to come in under 30 minutes and since I knew I could easily take a minute off my time (based on how long it took to get up to the starting line) I was thrilled! Oh, yes… I grew a beard over the off-season. It has since been shaved off… sorry to scare you there, readers. 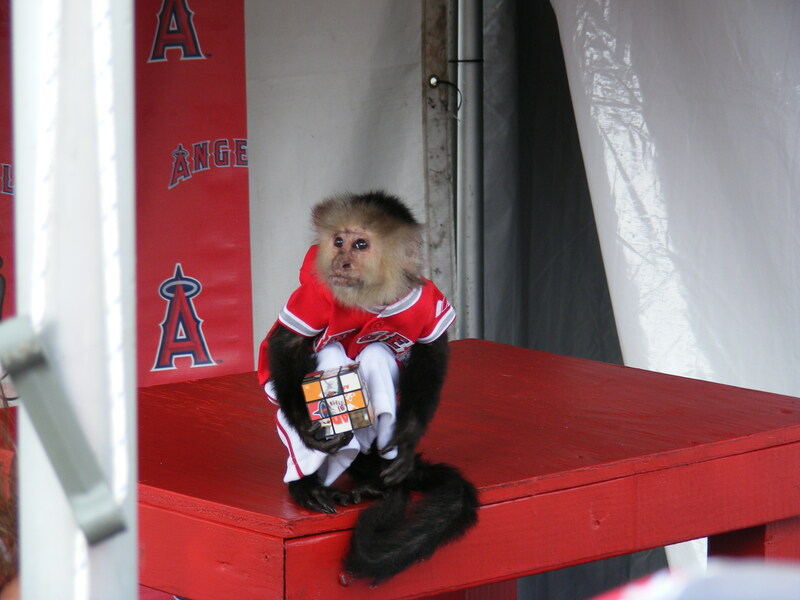 At that point it was about 7:45am and Angels FanFest was set to open up at 8:00… but I’d promised Michelle coffee and, quite frankly, I needed a rest. We headed to Starbucks–I changed clothes once we got there–we got breakfast and waited for the rain to pass… it had started drizzling right when I got back to the car after the race. –which I was kind of disappointed in once I saw it. I mean, we’re like six feet from the monkey! C’mon! At least we look cute. That monkey is licking the mini bat at this point, I think. 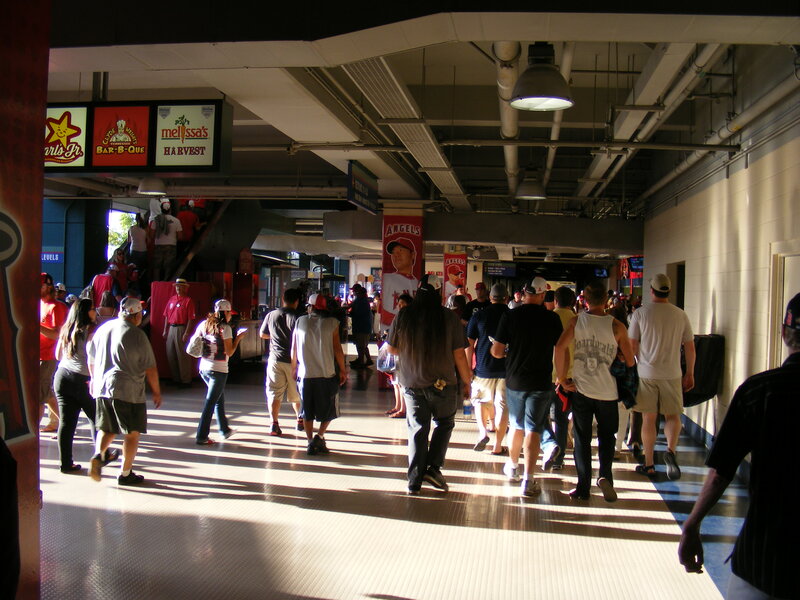 Anyway, we left FanFest after an hour or so–and went to get snacks for the game that afternoon. We’d need to be back by noon to get free parking for the game and, sadly, we found out once we were back with our snacks that the gates wouldn’t open until 1:00. Bah! While I took those photos I heard someone yell, “Comin’ in!” and I looked up, then to my right as a ball smacked off a seat ten feet away from me… surprising since a righty was up to bat. 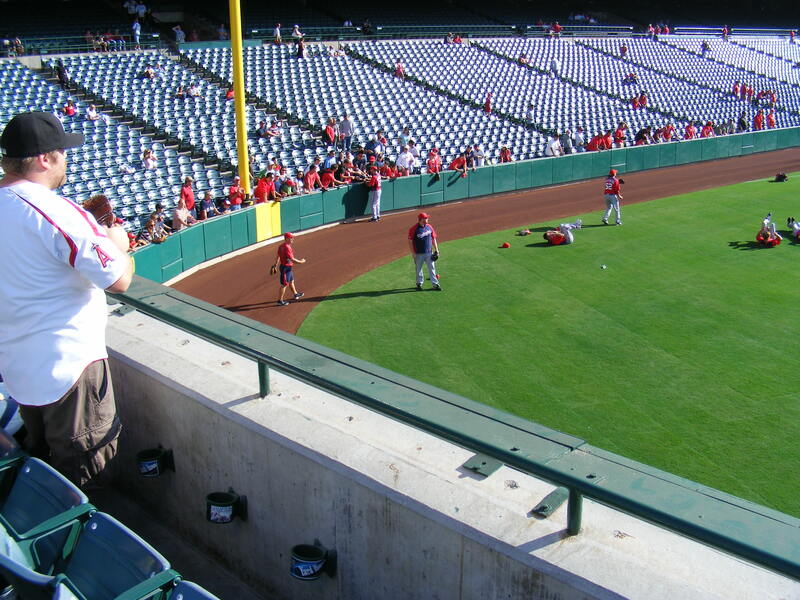 I met up with Michelle and hung out with her for a bit–and then headed toward the Angel dugout when they came out for pregame throwing. It was nice to see the field up close. I got shut out there but I went to the Padre dugout after that and got my third baseball of the day thrown to me by Logan Forsythe near the camera well. I was hoping to get a home run but the only homers hit this day would go to center field. Bummer. 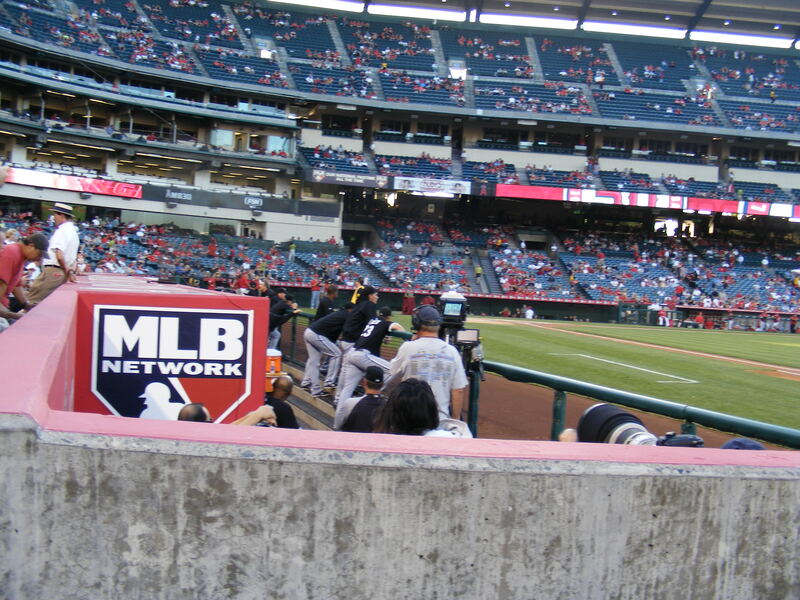 And as the Angels wrapped up the victory I got behind the Padre dugout to try to snag a postgame baseball… but all the Padres went into the dugout without tossin’ up a thing… except for the last player to leave the field. A short, Latino pitcher from the bullpen who I later identified as Samuel Deduno tossed me a rubbed up baseball as he headed down the steps for my fourth baseball on the afternoon. 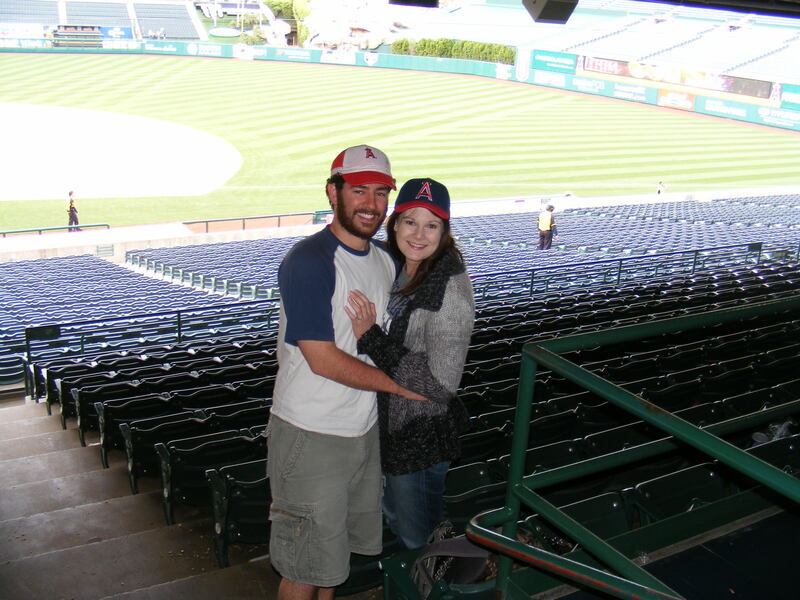 And, though it took him several tries, a nice, elderly usher took a photo of Michelle and I as we left the park. It had been a long day–lots of running–and we were both exhausted. Not a bad start to the season,,. 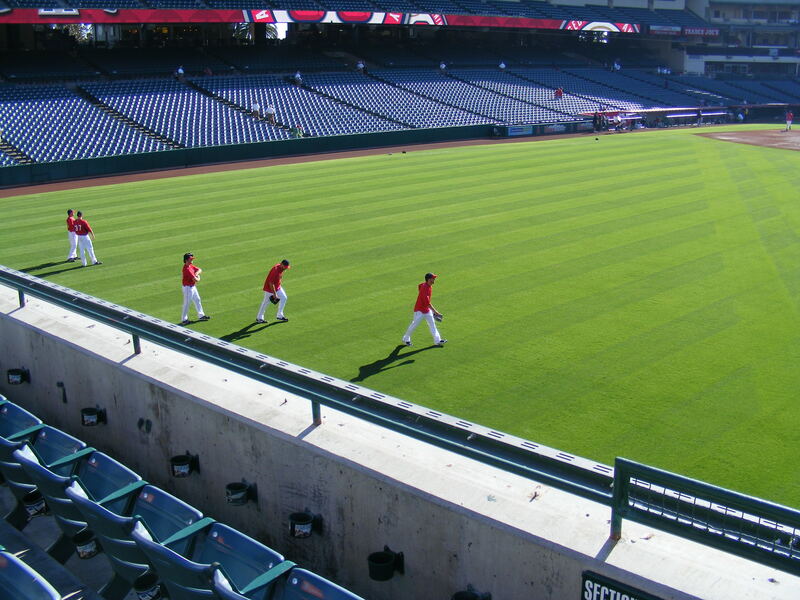 a good run, four baseballs, three autographs, some swag from FanFest, an Angels win, and a lot of fun. My next game would be on April 9th. More to come soon, loyal readers, and happy 2011 baseball season to all of you. You know, I’ve got no excuse for not getting these last couple of entries from the 2010 season up… but on the bright side, you get to read a baseball entry about a month early because I fell behind on my blogging! 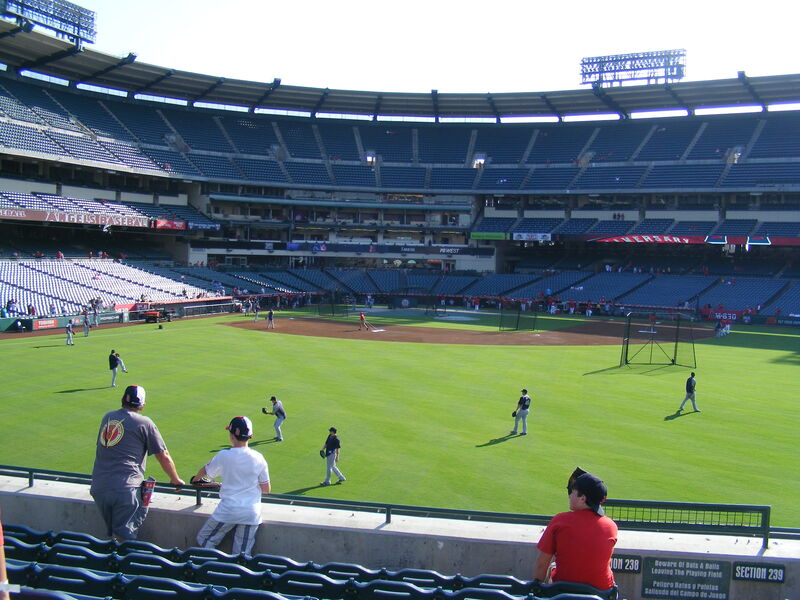 So, this game on the 25th of September out in Anaheim was the last Saturday home game the Angels would have and the last time I figured there would be guaranteed batting practice going on–so I had to be there. Michelle came with me and, as usual, we got there early, I ran in as soon as the gates opened and I hoped for a successful day of snagging. 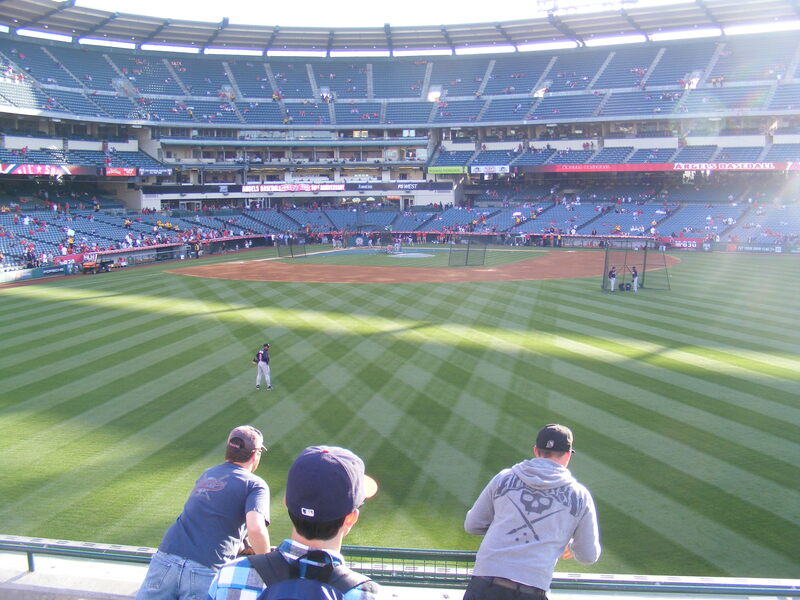 The Angels were hitting as I made it to the the right field seats and since there weren’t any Easter eggs around I played each of the batters hoping they would go yard. My first chance of the day came after a blooper from one of the other ballhawks in the pavilion. A guy who’s a regular at BP had a homer lined up and I was rushing in from his right side. Seeing he was in position for the catch in the second row I put on the breaks and stopped about six feet from him. He had a perfect snag set up but the ball bounced off the heel of his glove and back down to the field. 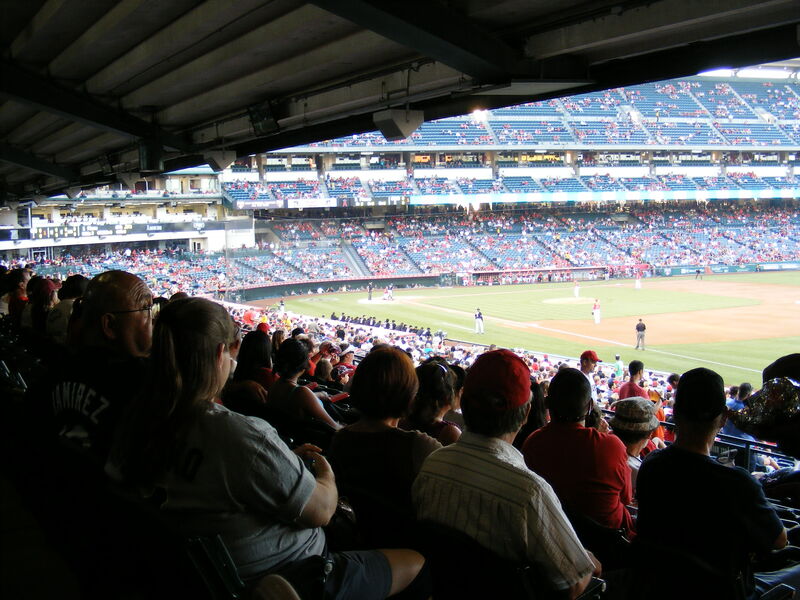 He cursed at himself and walked a section to his left hanging his head… but I could see the ball still sitting on the warning track 18 feet below me. Reliever Michael Kohn walked over to pick it up. I think he must have seen what had happened because after I asked him to toss the ball up he made a comment about making sure I could catch it. I said, “Yeah, gimme your best shot!” He lobbed an easy one up to me and sure enough, it was the bobbled ball (with just one distinct mark on it–from where it had hit the warning track). In the above photo you can see Kohn in the center of the shot and the spot where I was when he threw me the ball, right there in the first row. I was on the board for the day. I thought briefly about offering it to my fellow snagger but I knew that if someone tried that with me I would have politely refused… so I kept the ball but agreed to give it away to a young fan later that night. The first group of White Sox hitters were all righties and Juan Pierre (who, in ten years in the majors has hit 14 home runs) so I hung out near the foul pole in right field hoping for a slicer down the line. A few balls came close but they all seemed just a bit out of reach. That short wall is tough to judge sometimes. 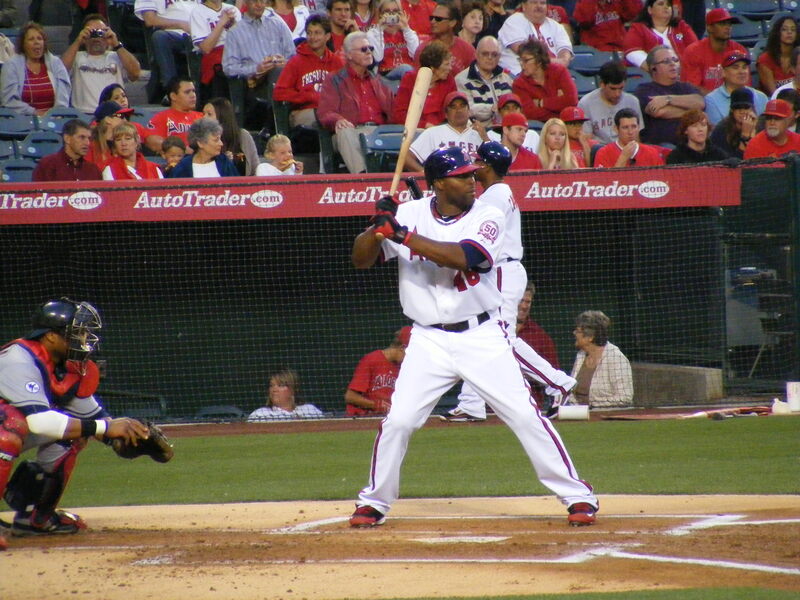 Well, eventually I got my shot off the bat of Juan Pierre. The ball went slicing down the line, took a bounce off the wall to my left and skittered to me across the dirt of the track. I leapt up onto the wall, leaned out over, stretched out as far as I could and made the backhanded snag. 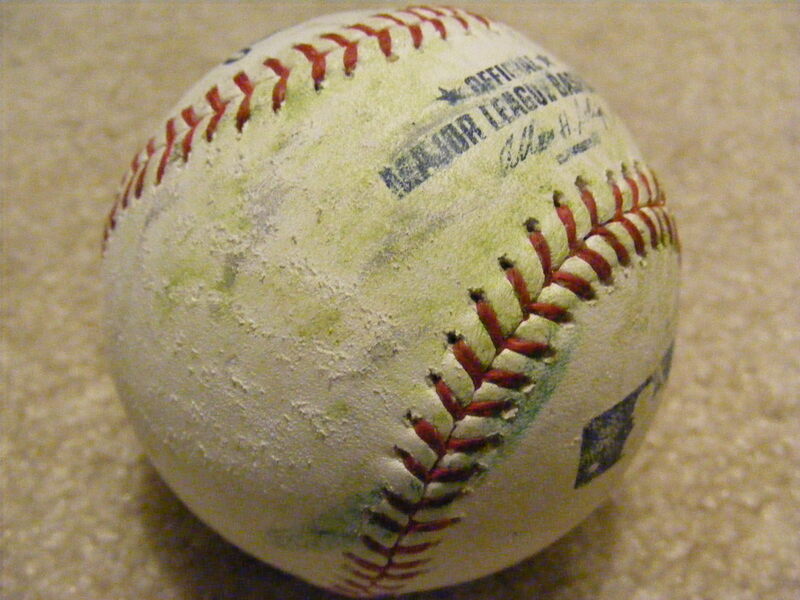 The ball was worn, with brown and green stains all over it–but it was mine and looked perfect to me. 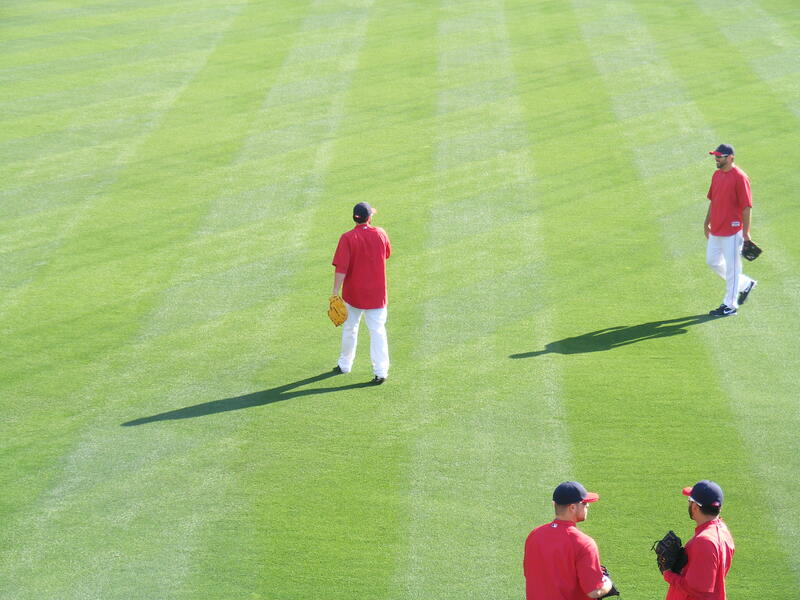 I’ve mentioned before that Howie Kendrick and Peter Bourjos end their warmups by throwing knuckleballs to each other. Well, on this warm evening they did just that… and as they finished Howie ended up with the ball so I stood up and yelled, “Right here, Howie! Show me the knuckleball!” Wouldn’t you know it? He did… he threw a pretty darn good flutter-ball that arched over the first six rows and settled inside my black Mizuno. Three on the day! Scott Kazmir was pitching for the Halos and he gave up five runs in less than four innings. Ugh. 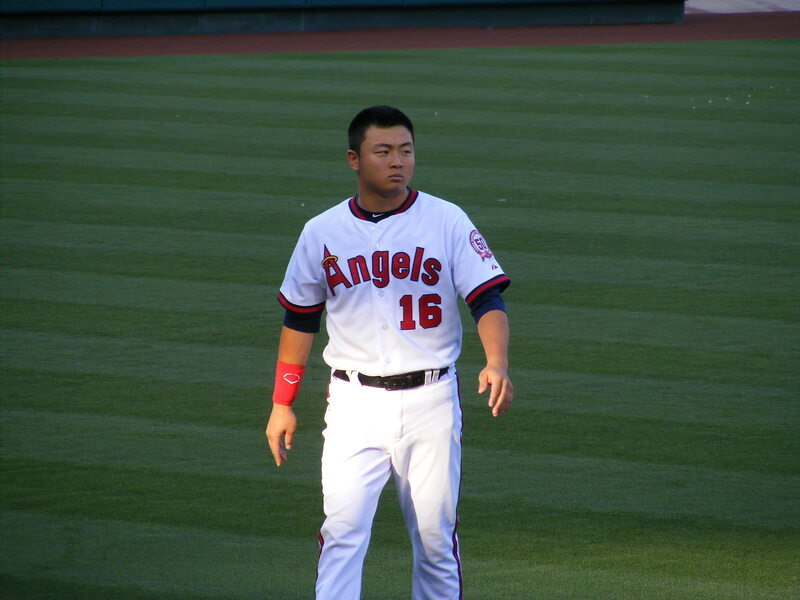 He’d earn his 15th loss of the season as the Angels, who started out well with two runs in the first, wouldn’t score for the rest of the game. Manny laced a double off Kazmir for an RBI. 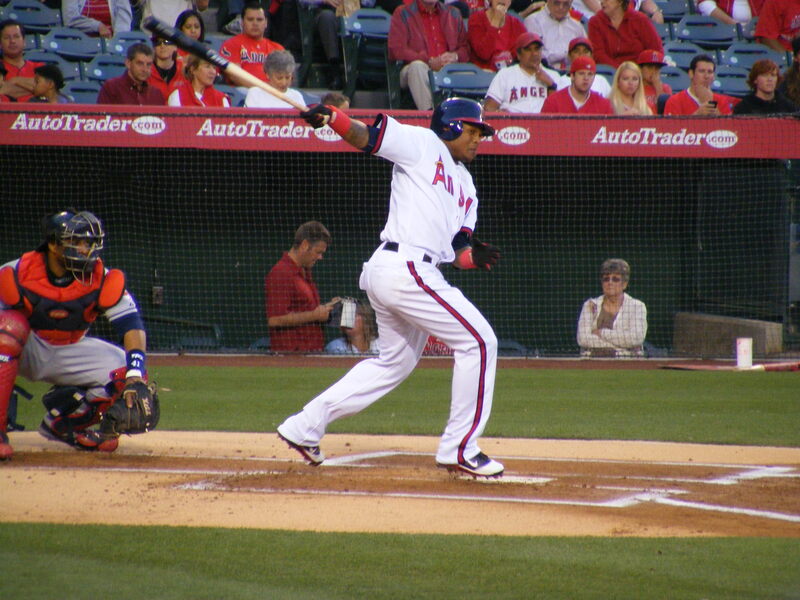 Juan Pierre got an RBI, too. So, that was… good. 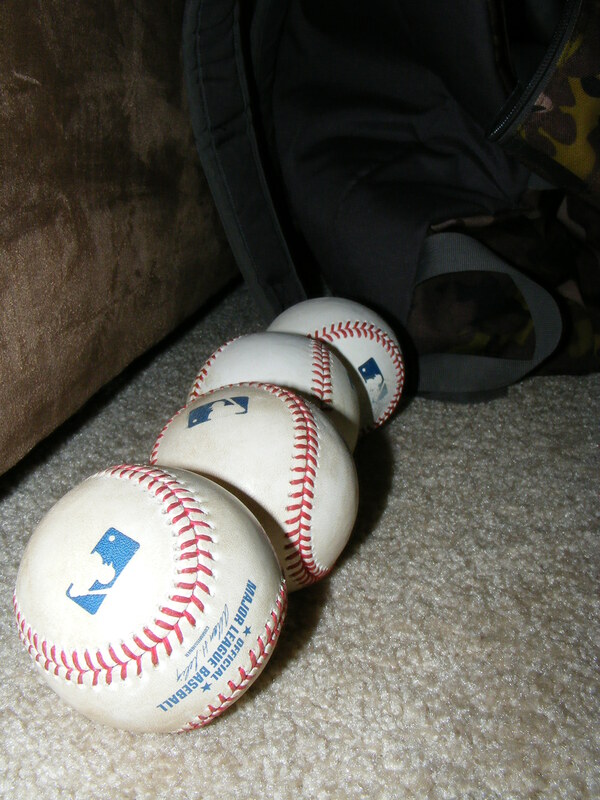 And I ended up with four baseballs–I gave away two of ’em. But the Angels fell to 75-79 on the year and I knew the playoffs were in doubt. still, a crowd of more than 40,000 came out to cheer on the Halos and that’s saying something. Hopefully, 2011 will be a better year.